Arkfield is specifically designed for people who need to showcase their work and spread it around the world. You don’t need to concentrate on improving the appearance of your site: Arkfield will do it for you. The only thing you need to focus on is what is your passion for your profession, whether you are a photographer, an architect, or a designer. Arkfield was developed as a theme that is easy to use even for those who have no experience with WordPress at all. 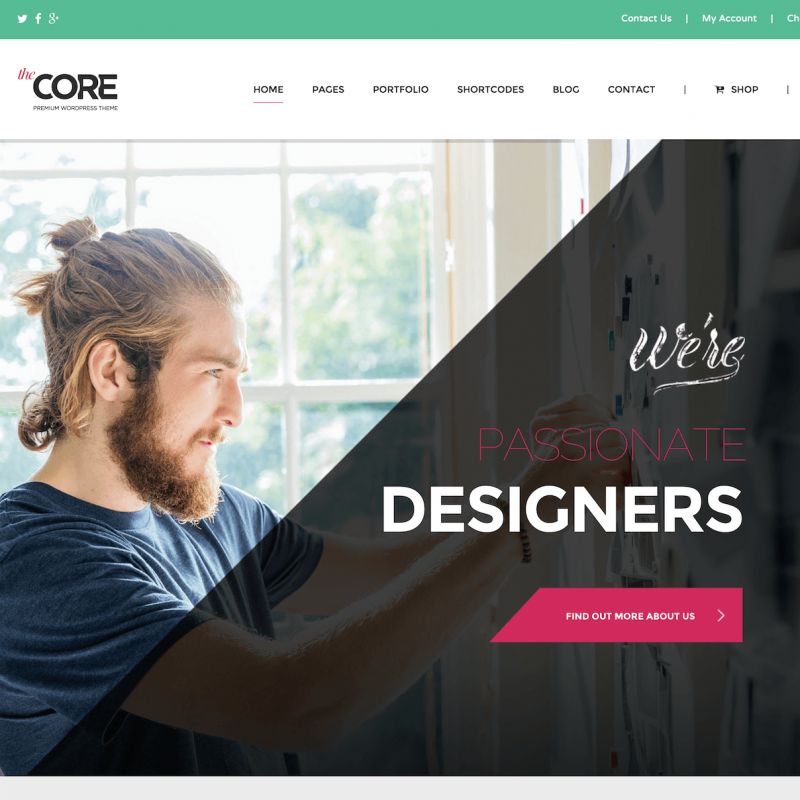 With the incredible flexibility and dynamic power of the page builder, you will be able to handle all the design of your website very easily. You can have multiple layouts of your portfolio and change them whenever you want, your portfolio will take the shape you want in a matter of seconds. Just define the projects you need and Arkfield will take care of the job. You will be surprised at how flexible and good-looking Arkfield is on mobile devices. Beautifully animated Magnific Popups will enable you to showcase your work in the best manner possible. You will get 100% control of your text and graphical content using 9 effective shortcodes included. You can use them to choose text columns, elegant quotes, or beautiful icons. Arkfield offers you to choose nice fonts from the extensive Google Fonts library. You can change a font size, line height and letter spacing. Create contact forms on your pages using special dedicated Contact form plugin. Avawa represents a great opportunity to establish a showcase site for freelance designers and creative agencies. 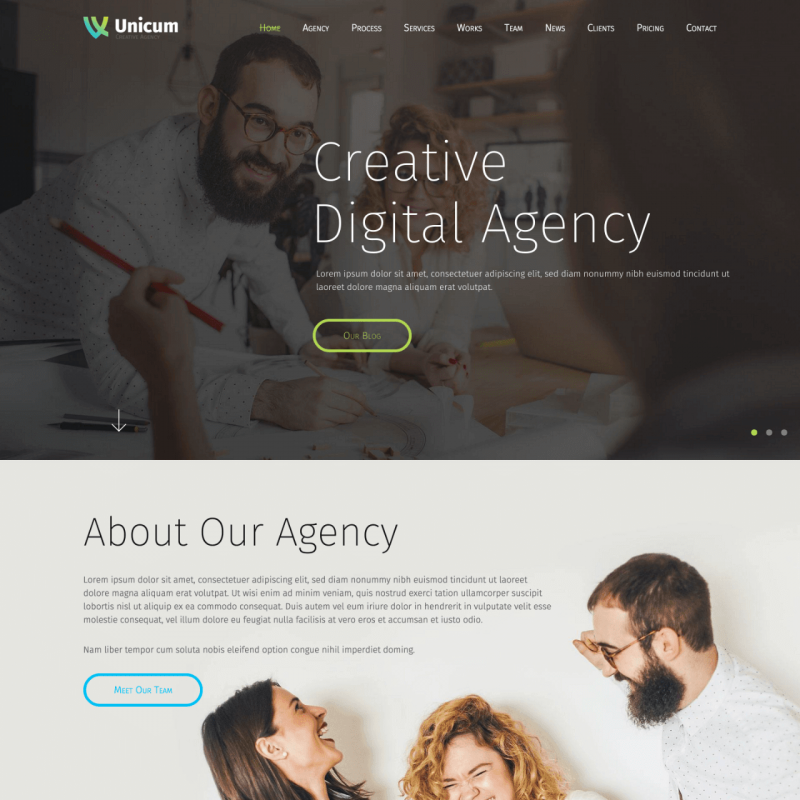 With its huge set of options and layout designs, it allows a very easy and fast setup of a website with a unique look and an individual style. 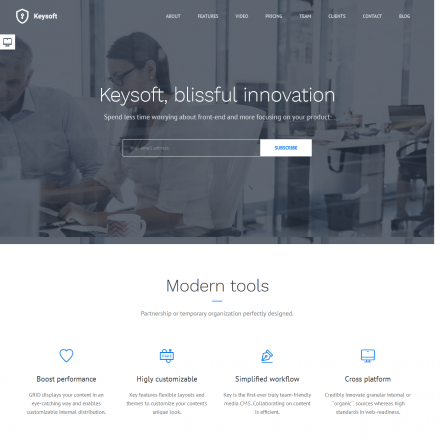 It contains a wide range of drag-and-drop elements that provide a great user experience and a modern look. More than 45 hover effects are included to provide unique visual effects and smooth animations for your product presentation. 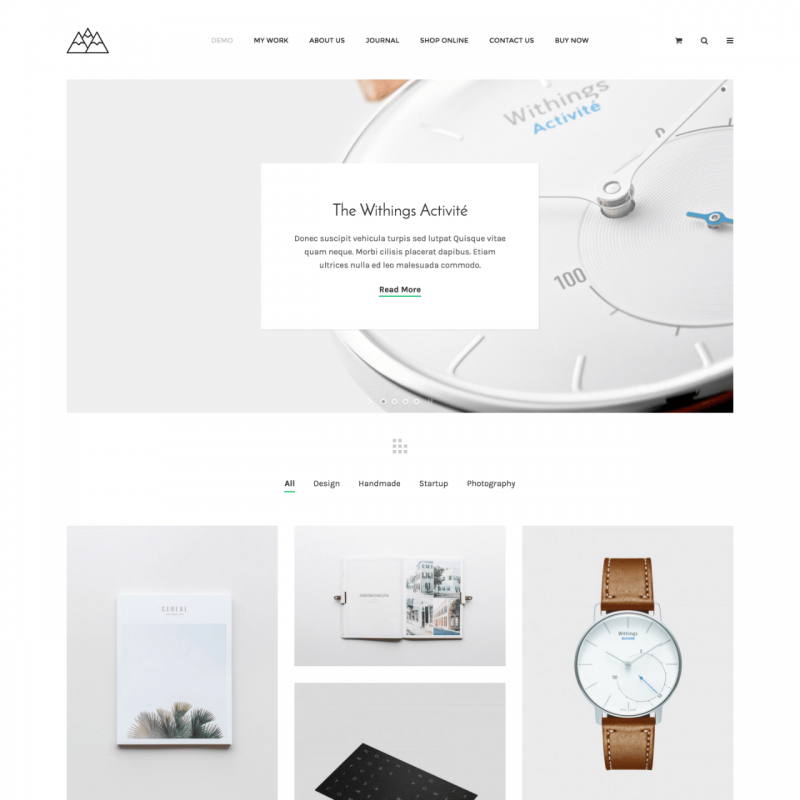 The Avawa template is fully responsive and Retina ready. For any type of creative content such as illustrations, photographs, or software gallery it opens up an ability to impress your visitors. You don’t have to use any coding or complex knowledge of web-technologies to set up your personal web-page. With the 10 layouts of portfolio view provided, you can just choose the most suitable one for your site purposes. Blog layouts are included as well. And if you like more options, it’s easy to edit the page with the Visual Composer plugin included. Still not enough? Apply all the power of the Ultimate Addon, which opens up unlimited possibilities to design your site on your own. And yes, all these commercial plugins come with Avawa absolutely for free. 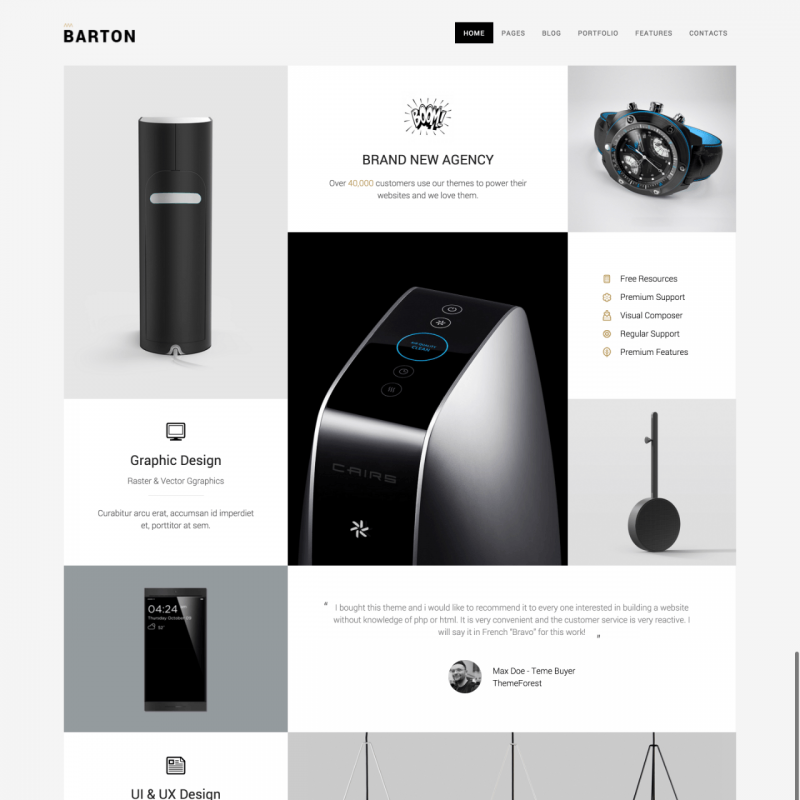 Barton is a powerful and feature-packed WordPress theme created in a minimal and clean style. Barton is extremely customizable and flexible. An HTML5, CSS3 and jQuery-powered portfolio is easy to build thanks to the Barton’s functionality. You will be able to use it to showcase your services with a cool design that has a clear and creative touch. You can present any product, or photograph, or illustration in the best way and leave your clients highly impressed with your site’s design. Barton provides post formats support, multiple slideshows for each post or portfolio entry, advanced color and typography options. A drag and drop webpage builder, the Visual Composer, will save great amounts of time customizing your site’s appearance. The abilities of your website will be only limited by your imagination. The Slider Revolution plugin which comes with Barton, will let you create an awesome full-width slider to better showcase your work results. Setting up a portfolio for your creative content becomes a breeze with Brehoh template. Its modern and elegant design is very handy for most freelance artists and illustrators, digital agencies and photography studios. Many customizable theme options open up a huge potential for page editing. Choose an image slider or a Youtube video-based background for your digital portfolio. Create custom layout for your page by just adding or removing unnecessary modules. Responsive design creates unlimited options of viewing the site for any visitor. 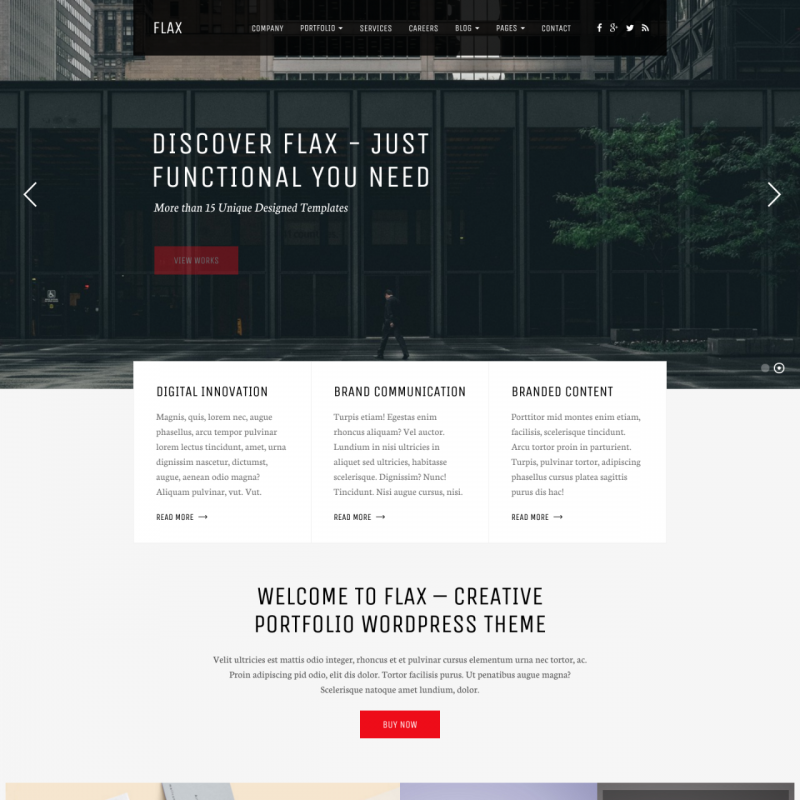 The Ajax portfolio included with the theme keeps the minimal design of every interface element and adds a unique modern look to the whole page. Create your blog posts in Brehoh using different included formats. With Divergent, building the brightest and the most memorable resume online is a breeze. 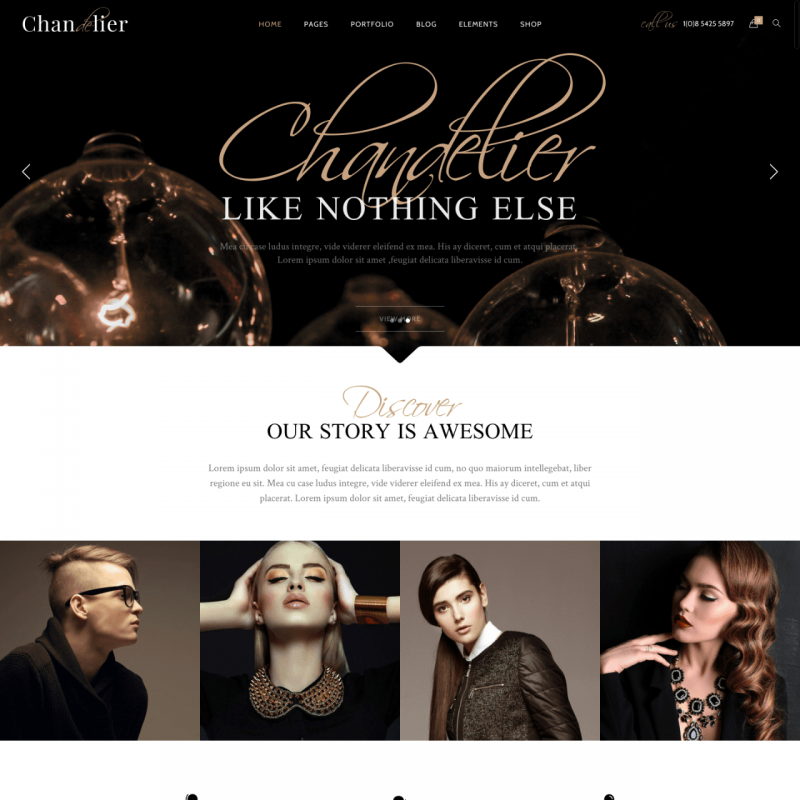 A unique 50/50% frontpage layout with an awesome jQuery powered animation makes sure that your visitor is amazed at the classy and professional style of your website. You are in 100% control of the site’s fonts and colors. Divergent boasts a shortcode generator and a great set of ready-to-use shortcodes. The sidebar menu slides in on your mouse-click upon its icon. With Divergent, you are capable of building an almost unlimited number of fully responsive video or image galleries with the built-in DV Gallery plugin kindly provided by the theme’s developers. You have also got extra blog pages and easy-to-use YouTube video and slider style page templates at your disposal. The XML demo file is included in your purchase, along with the .po translation files. 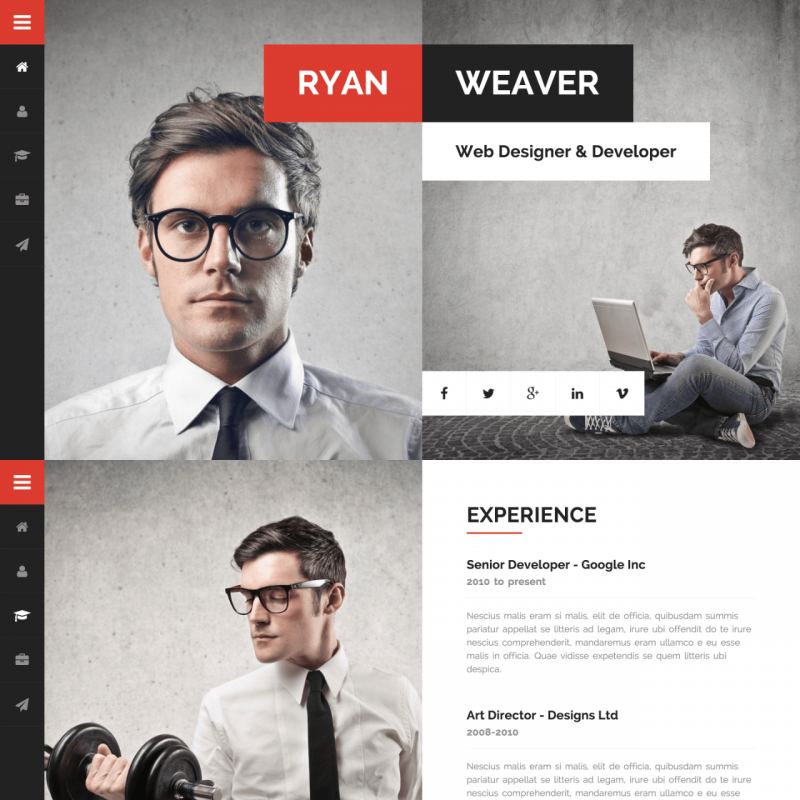 Using this awesome WordPress vCard theme for your internet CV will certainly set you in front of all of your competitors. The theme can be effectively used for individual resume pages and portfolio websites of large agencies. 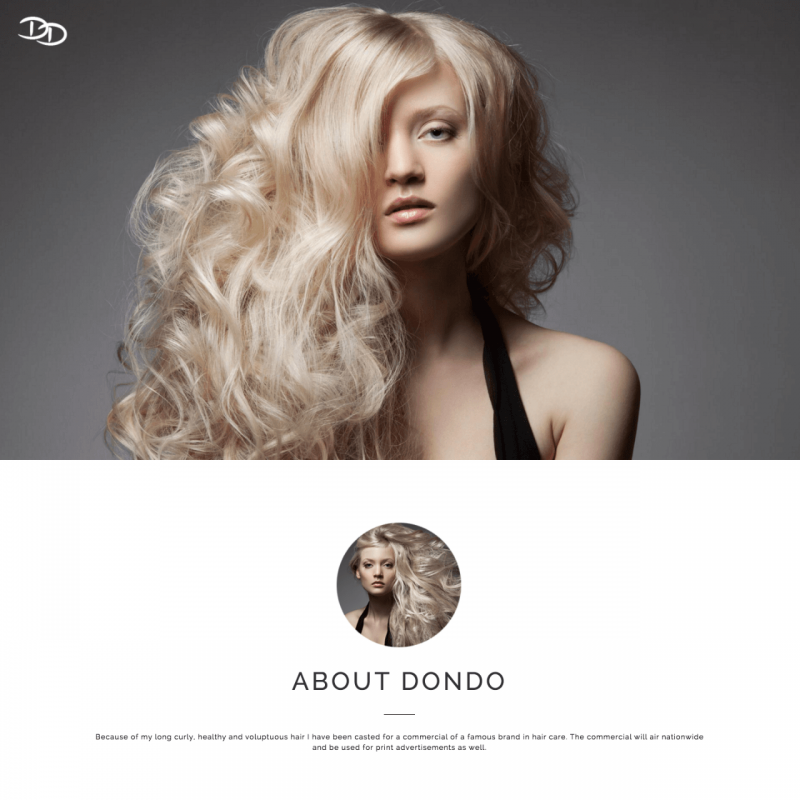 When you need to create a shining presentation for a model or agency, DONDO becomes a well balanced choice. It’s a fast and easy way to set up an animated portfolio with advanced options for web presentation. Build up a basic web site by just selecting one of 5 header layouts and custom page and category layouts as a starting point. Use the Visual Composer to set up a unique look for a showcase page. And with the power of all the included shortcodes, you can make an unforgettable impression on any visitor. 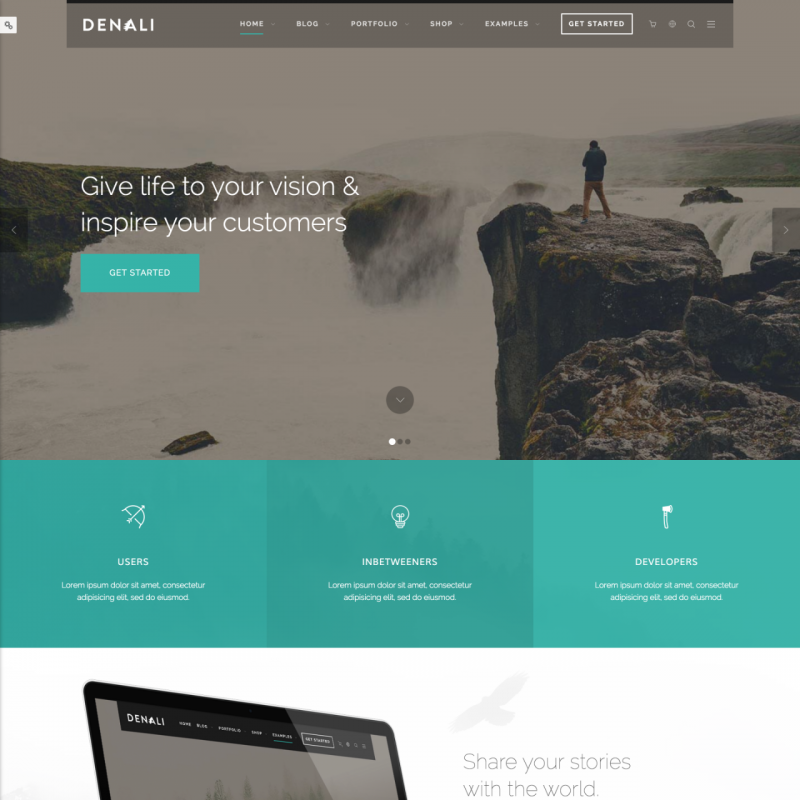 DONDO is a versatile and fully-responsive template which looks perfectly on any type of mobile, tablet or desktop platform. Choose a one-page or multipage configuration and set up impressive navigation with smooth scrolling. Try to use predefined multi-footer layouts to represent all your contact data and personal information. Apply animated portfolio options and an off-canvas menu to create site which stands out of a crowd. 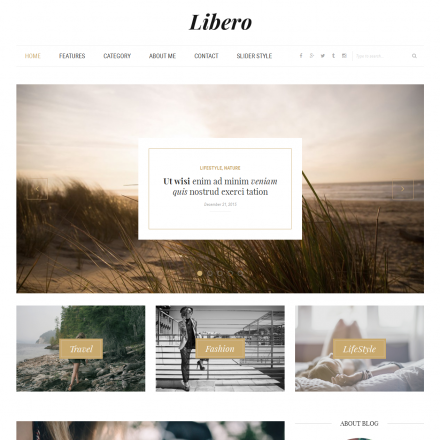 Use the available multi-blog layouts to express yourself in the best way. And don’t forget to adjust multiple typography and color options. 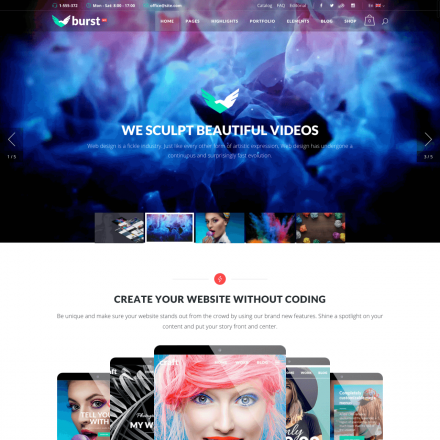 This theme’s homepage shows a vivid and colorful animation. You can choose from 60 animation effects powered up with AJAX data load technology. 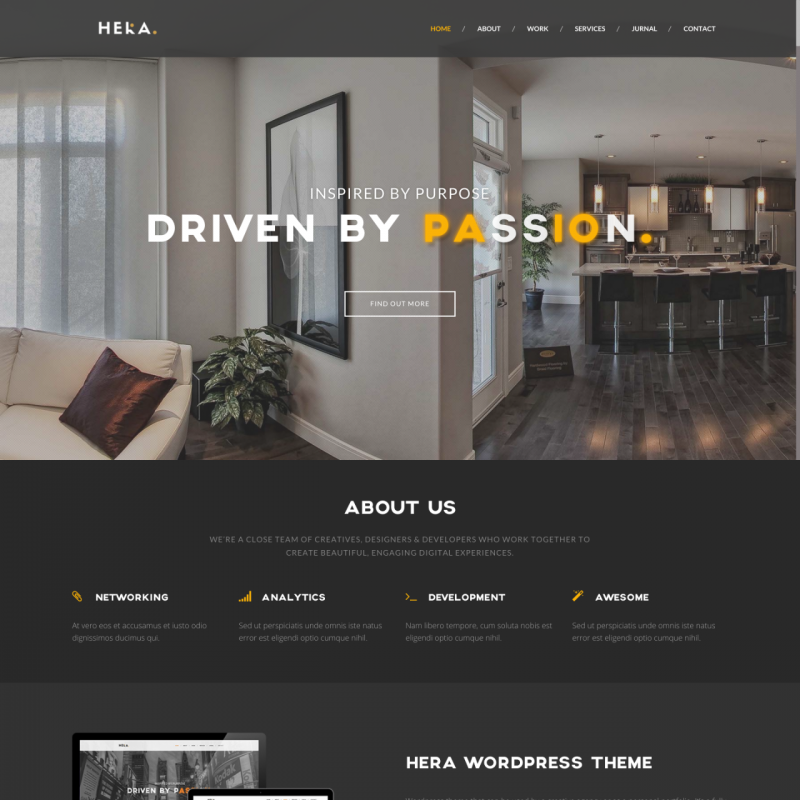 There are 3 options available for your homepage: a fullscreen image with text, a fullscreen video and text, or one of the the six portfolio layouts: two, three or four-column designs in the Masonry or Grid style. Your portfolio projects may be configured in 4 various options. 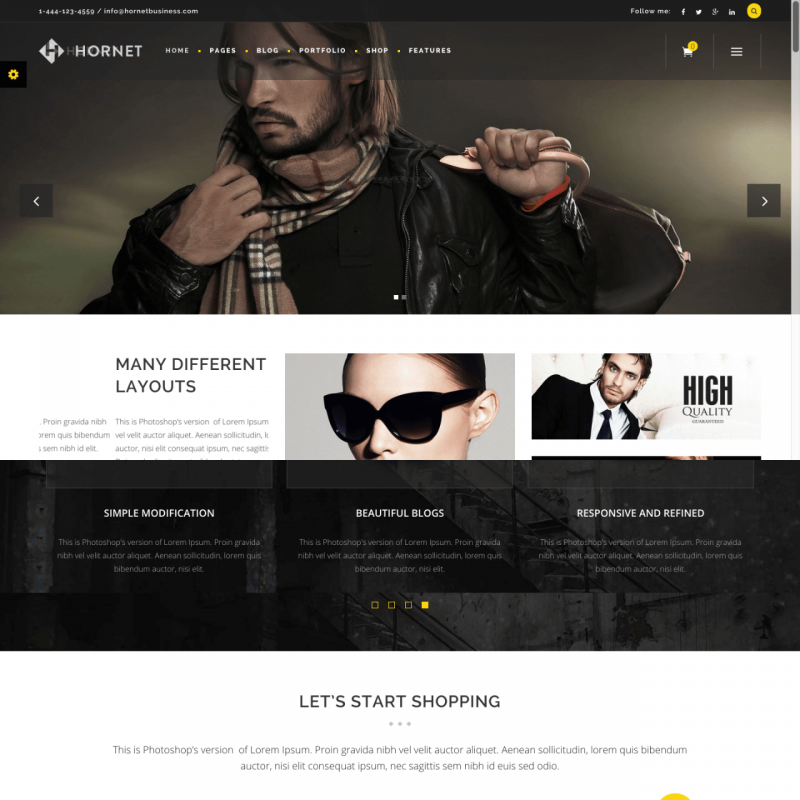 The theme provides 8 color schemes, 5 background colors for navigation, and 4 background colors for pages. The theme includes the $33-worth Visual Composer plugin. This crisp and clean template suits well to share your portfolio, especially if you run a freelance studio or a creative agency. 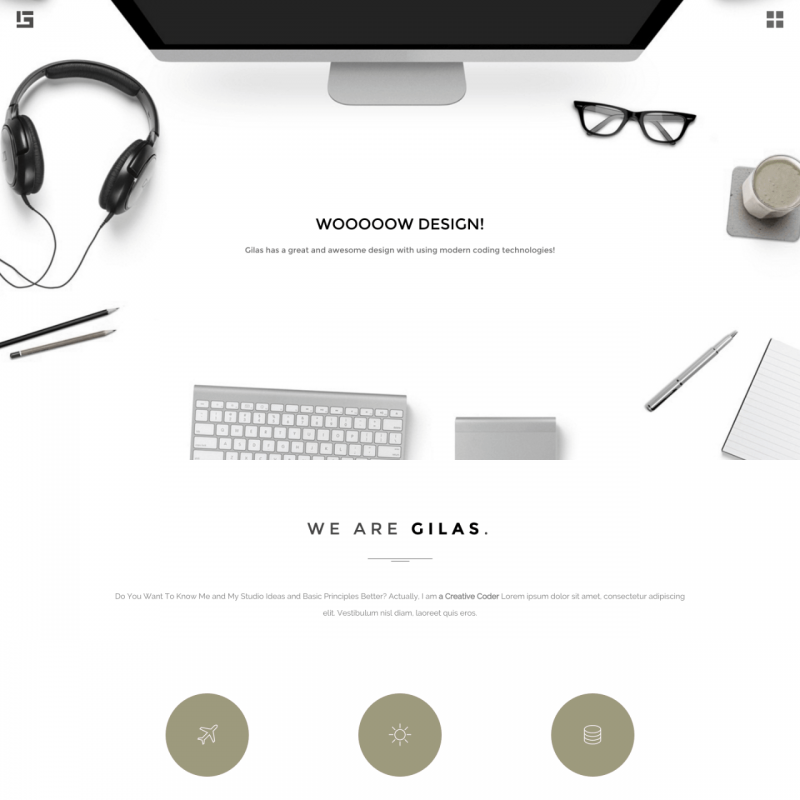 The Gilas theme contains one-page or multi-page configuration that allows to set the best view of your content. The cross browser support and responsive design reveals your site to a huge number of people who use mobile or tablet devices. Create individual descriptions on special portfolio detail pages. Filter your portfolio by categories with a set of predefined options. Refresh your homepage using background images with the incredible Parallax effect or a fullscreen image slider. Select blog layout to display your posts. Place a contact or feedback form in a separate section. Add social media buttons at the footer area of your site. Within its sharp look and minimalistic design, Kvadrat gives a huge variety of set-ups and layouts for its users. A discreet composition doesn’t mean excessive simplicity. 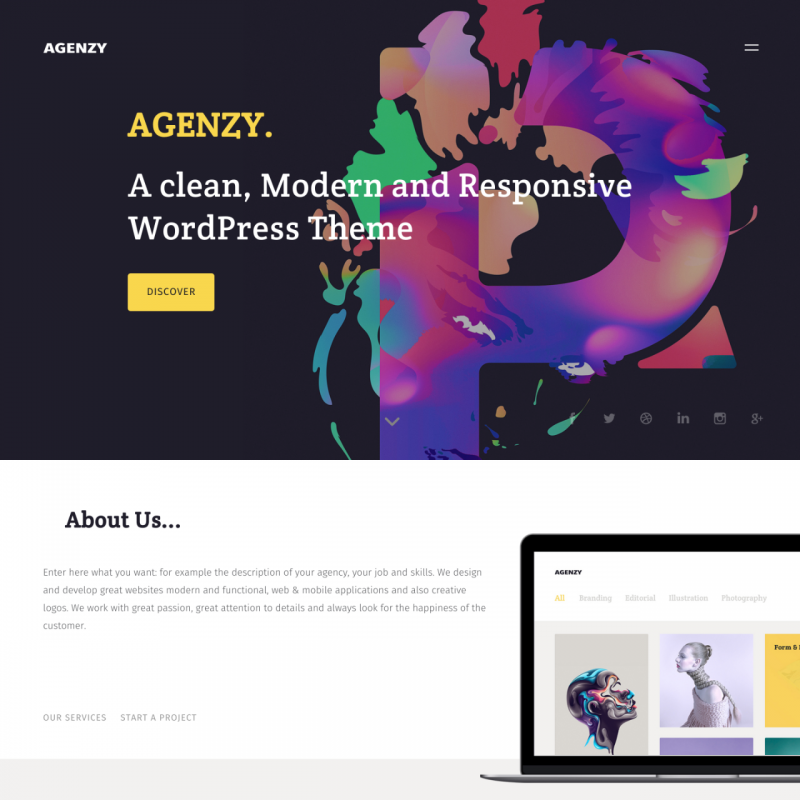 This WordPress theme builds captivating capabilities with included wide abilities and feature packed efficient options. Its crisp design elements look fantastic on any sort of devices. 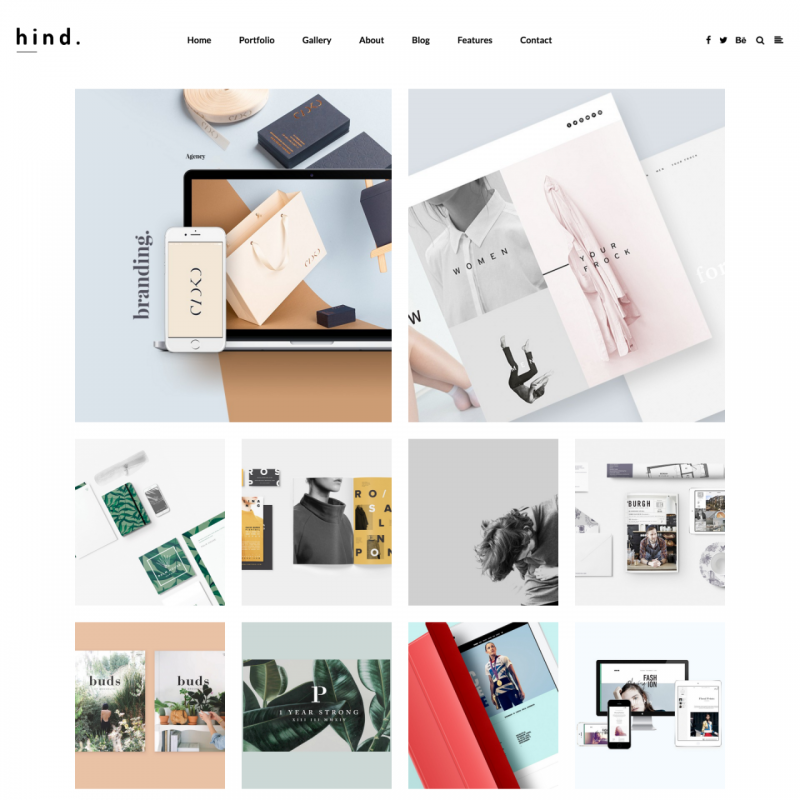 Portfolio building will feel like a breeze to you with that huge variety of included starting pages and portfolio layouts with category filter and animations. 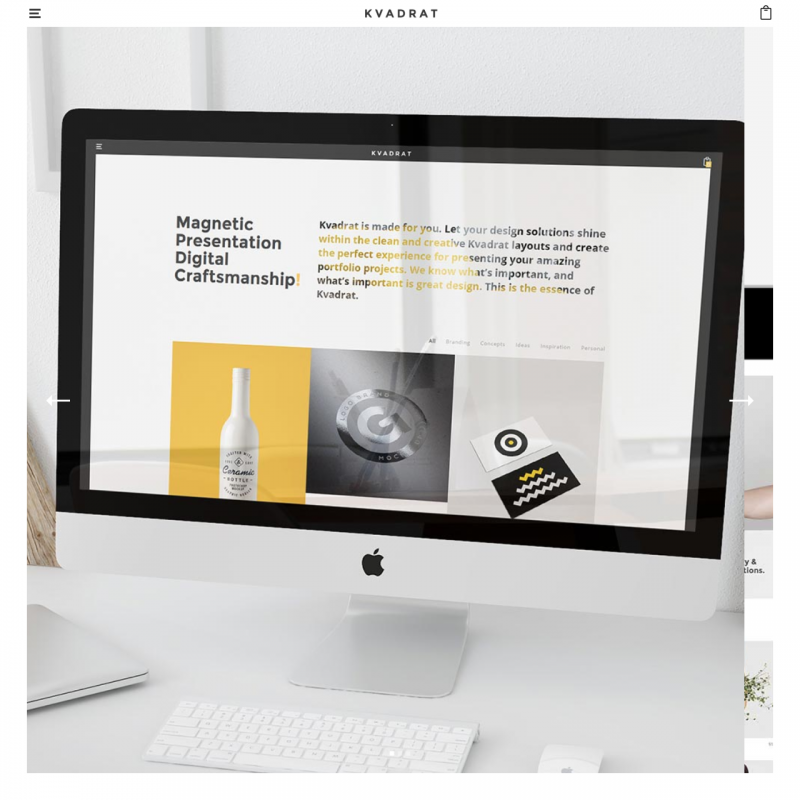 For bloggers and Internet writers, Kvadrat is a fabulous theme to share your stuff around the world. Any product review or blog post could be shown in the right way with a broad variety of predefined blog layout combinations. 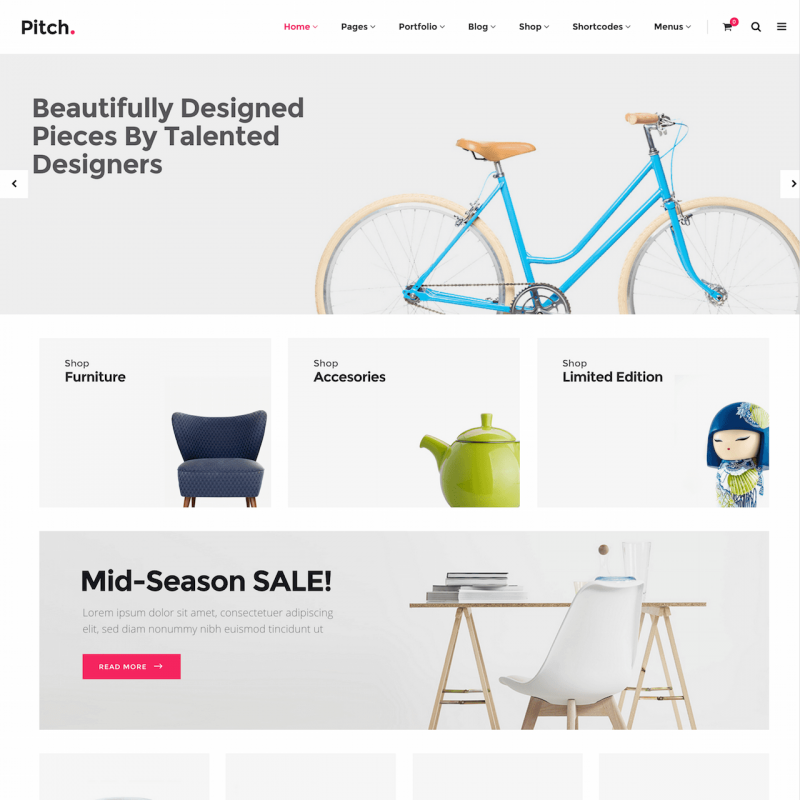 And if you are going to create an online shop, it will be outstanding with WooCommerce free plugin compatible with this theme. 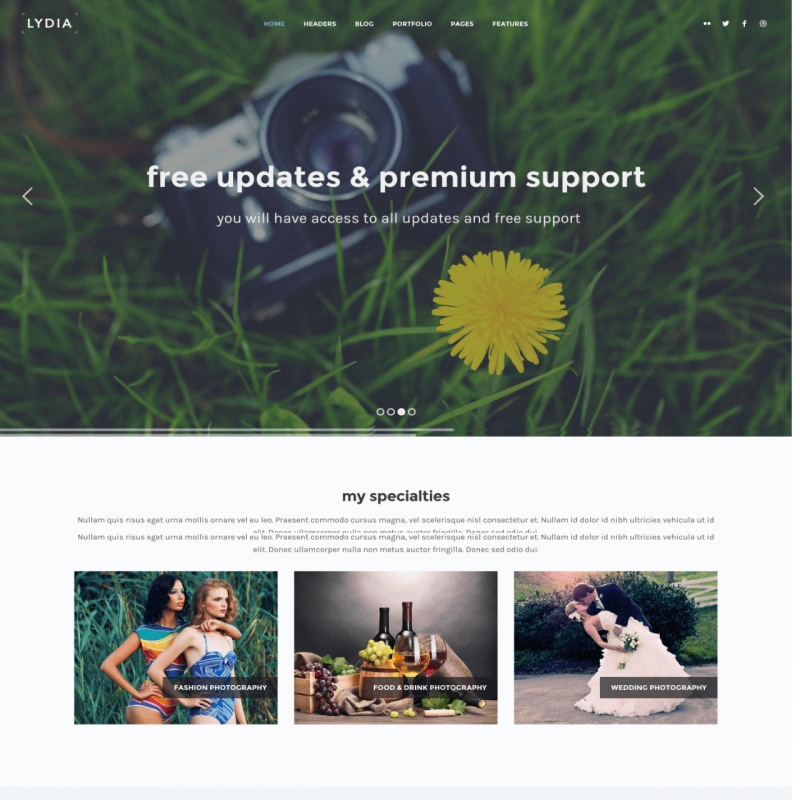 Lydia is a responsive professionally looking WP theme with a neat and clean design that is sure to provide an awesome solution for your project, blog, mag or portfolio site, or actually a site built with any other purpose in mind. Lydia’s responsive layout is capable of adapting to every screen size you can dream of, which makes your site look perfect on whatever device your visitor is using. 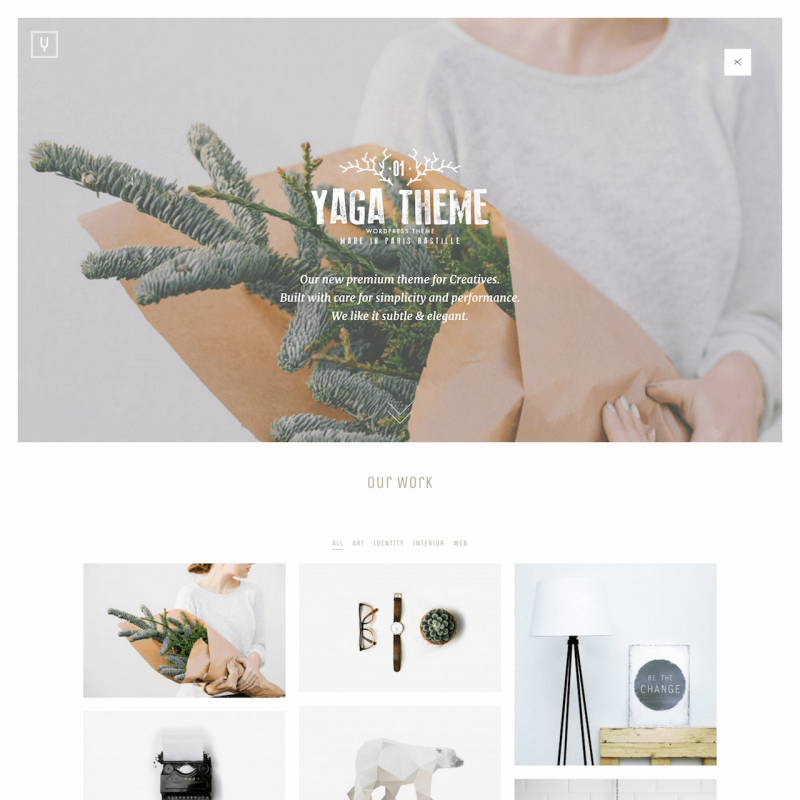 This theme’s page builder boasts loads of easily customizable features! Portfolio feeds, blog feeds, carousels, anything at your fingertips! Each of these features is readily customizable. It’s possible to set up Parallax background pictures step by step when creating the site pages. Lydia lets you set a custom Retina-ready logo or even a logo for the WP Login screen, and that’s with only a few clicks. 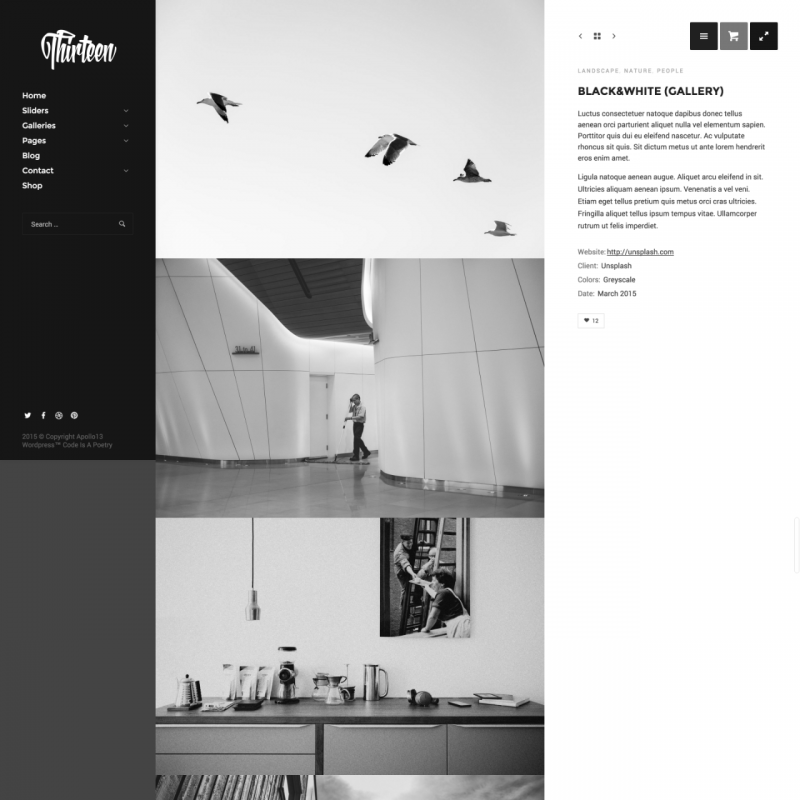 You can use Classic Blog or Grid Blog layout with or without a sidebar. There are 6 various blog layouts, and with the page builder included, you can even change this on individual pages. It means that you can set up one kind of layout for one category and a completely different one for another one! And of course, the portfolio type layouts are just beautiful! The theme provides you with a 100% control over the theme colors, you can change all the colors in no time using the live preview theme option. 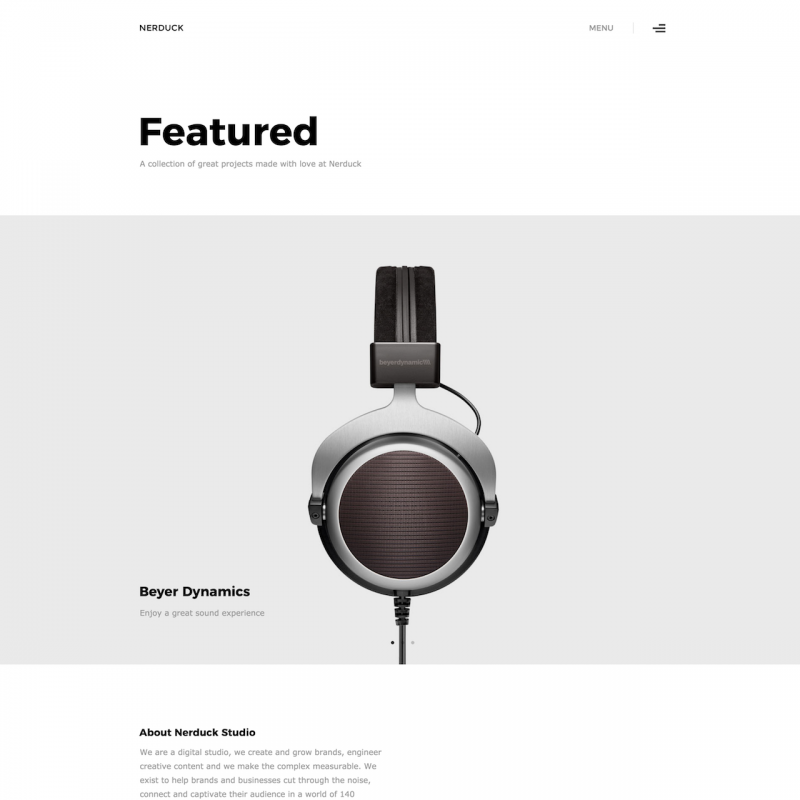 Monsterrat theme with its minimalist design and modern web functionality offers for many agencies and freelancers a quick and simple way to create their own digital portfolio. In a wide range of minimalistic site configurations, any type of photographs, illustrations or images will look fresh and accented. Even a newcomer to web design technologies will have no problems to easily build a site based on this theme without any coding skills at all. With a free addition of Visual Composer, starting to create an original and unique showcase is simpler than ever. This page building plugin allows you to adjust predefined page configuration for your goals using a simple and easy to comprehend interface. The drag&drop functionality allows you to customize the appearance of your site’s pages on the fly. By the way, with Monsterrat, you don not have to use standard visual elements for your site design. 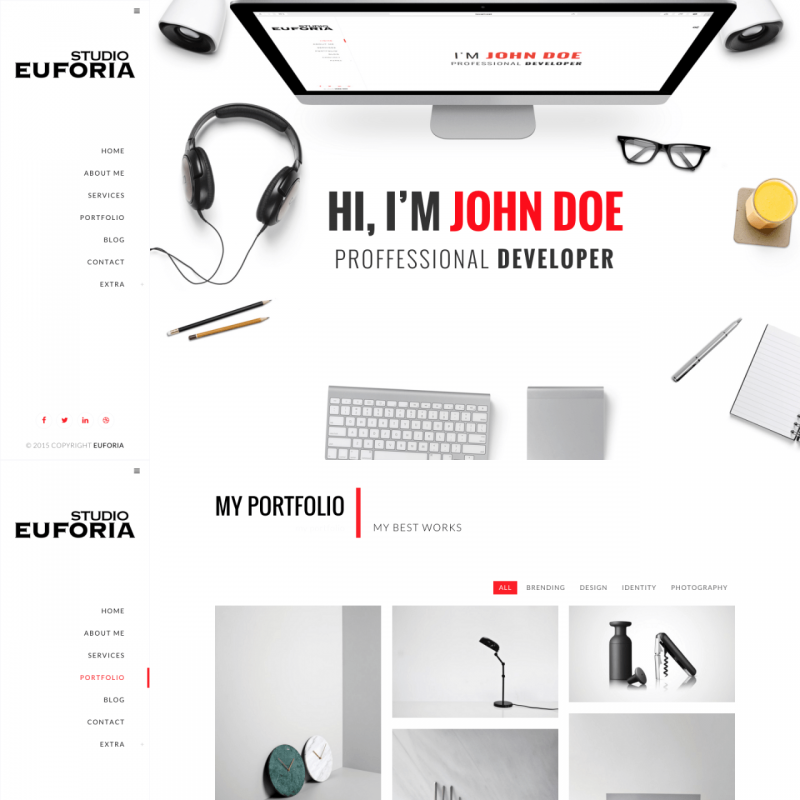 There are many custom elements included, so you can define a fresh and shiny look to your personal portfolio. Adjust menus and sidebars to give your visitors maximum comfortable navigation. 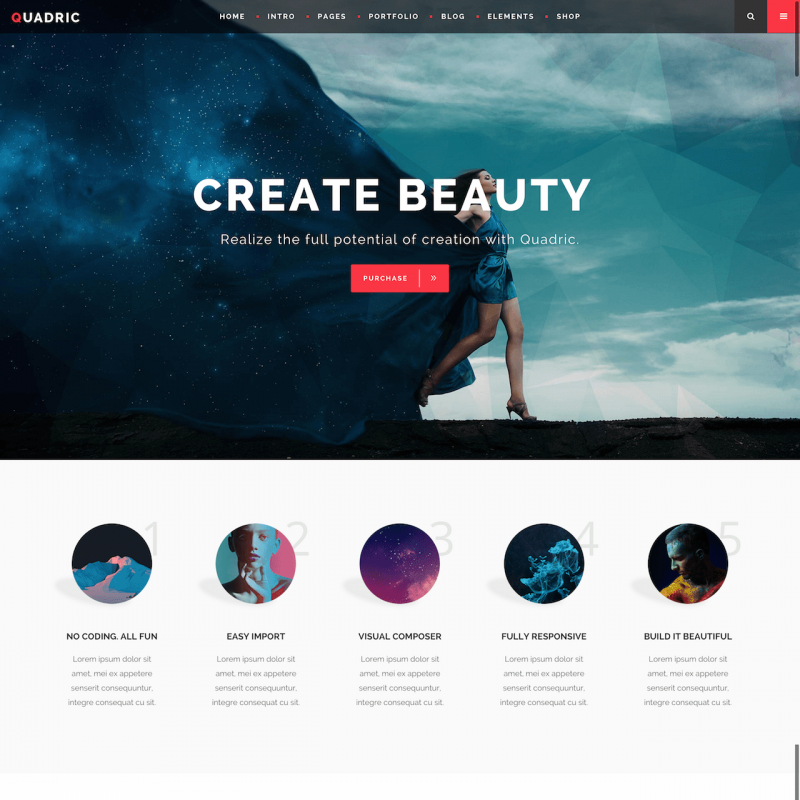 This will add the maximum possible functionality to the minimal design and allow your potential clients to view your creative content in the best way. 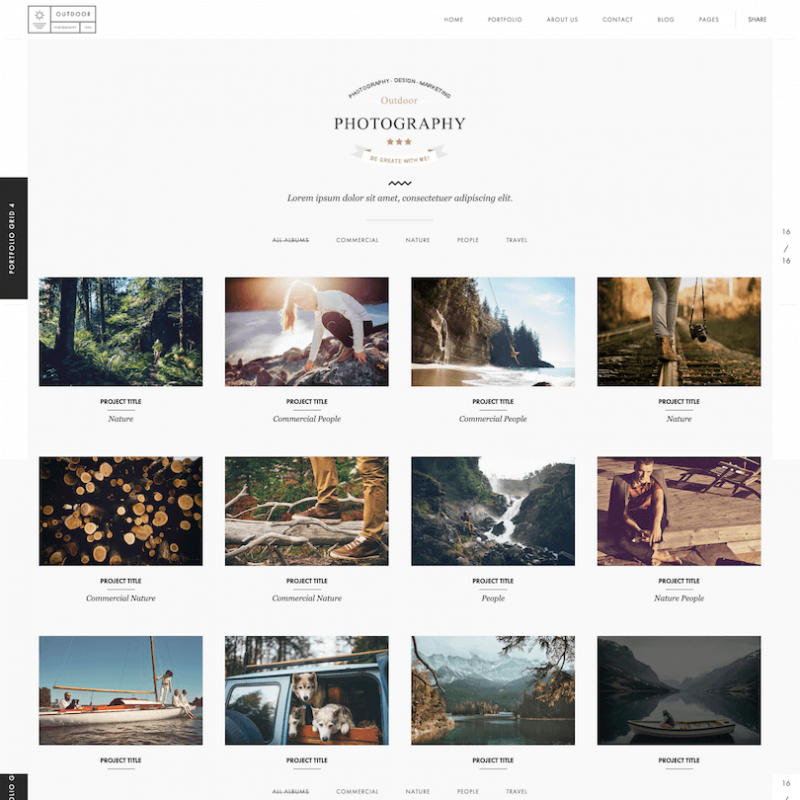 Mountain represents a perfect opportunity for freelance designers and digital photographers to create a modern-looking portfolio with rich configuration options. With the integrated blog layout, you can inform your customers about all news and changes in your professional field. WooCommerce plugin compatibility also represents Mountain theme as a nice web site for a start-up. List all of your products in a selected manner and provide full connection to the real market. This theme also is SEO optimized and has a great access speed that is very important for young and fast-growing projects. Mountain contains 12 creative premade variations for starting pages. 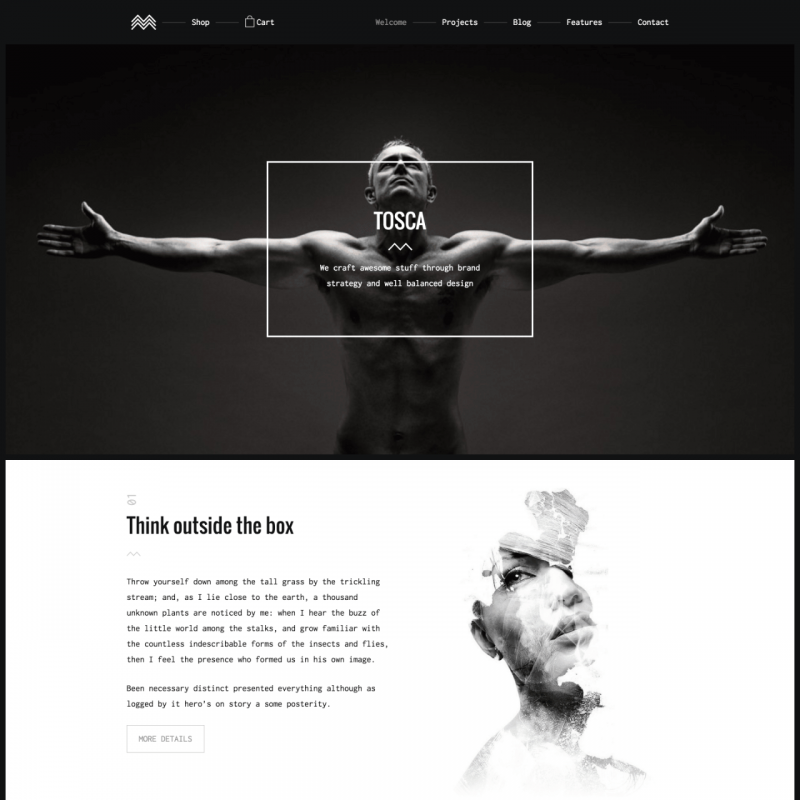 4 beautiful layouts are available for your portfolio. Edit the configuration of sidebars to provide maximum freedom for your site visitors. Select boxed or widescreen layouts for the most compatible with your creative content visual style. 2 layouts for blog posting allow you, in the best way, to express your talent. 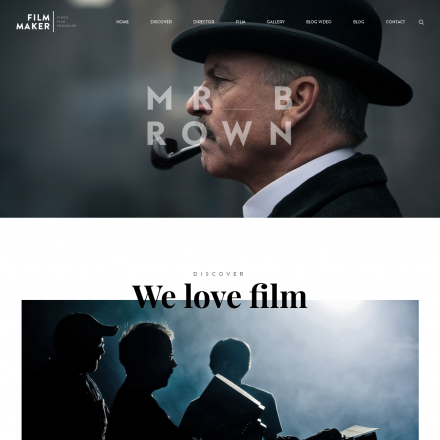 Use a Masonry layout or choose a classic layout with full-width images and righthand sidebar. With its minimal style and versatile layout, Nerduck becomes a great choice for a portfolio display. It provides great navigation and content section subdivisions that can be used by different freelancers and studios to provide site visitors with maximum information. While using this theme, users can customize almost everything in main page configuration and styling options. 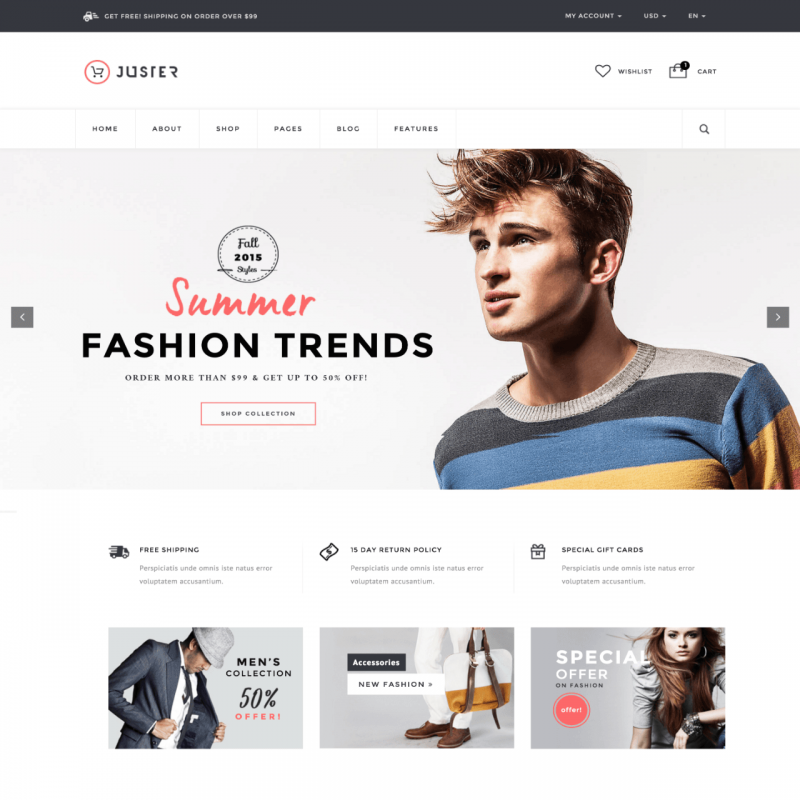 This theme is provided for free with commercial plugins Visual Composer and Revolution Slider, that gives 53 dollars of direct savings. Customizing your digital portfolio is very easy. You can choose Classic Grid or Masonry display with or without margins and different number of columns. Extended filter can be very useful, when you need to categorize site content. For every blogger, Nerduck is a real state of the art. With its exclusive attention to every detail and impressive typography, you can just enjoy by sharing a new post or any kind of useful information to your web audience. Within its strong style and collaborative options, NRGagency was designed exclusively for marketing bureaus and companies. 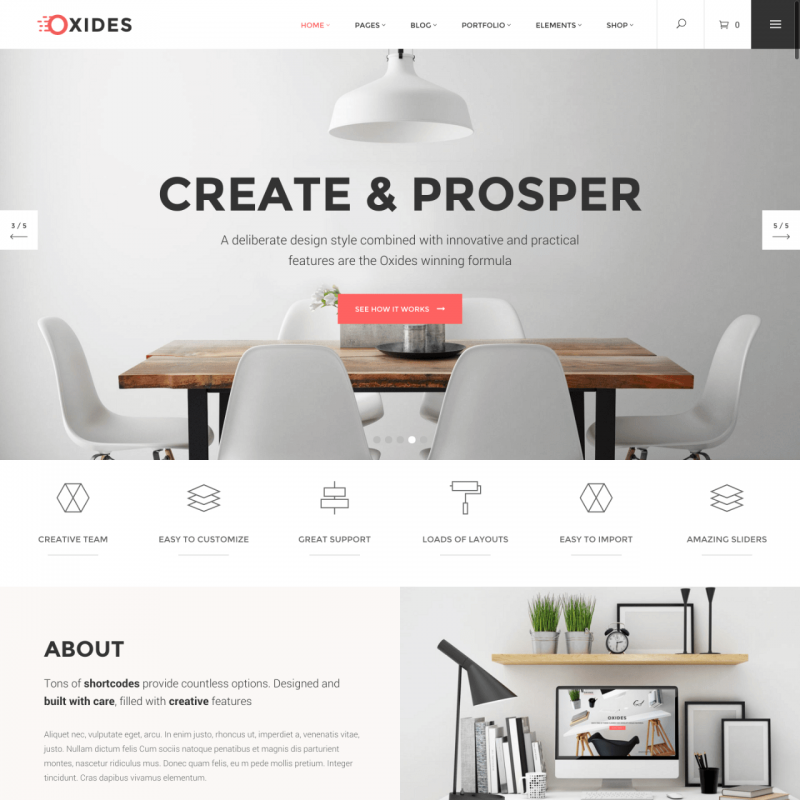 This WordPress theme suits well for all purposes with its cross-browser support and responsive design. It is really easy to install and maintain this template. Besides, layout editing will become a pleasure for any NRGagency user. Included for free, the Visual Composer has got advanced options of page editing. This template contains many specially developed design elements which provide many extra options for every site. Any site configuration may be modified into a one-page layout in just one-click. 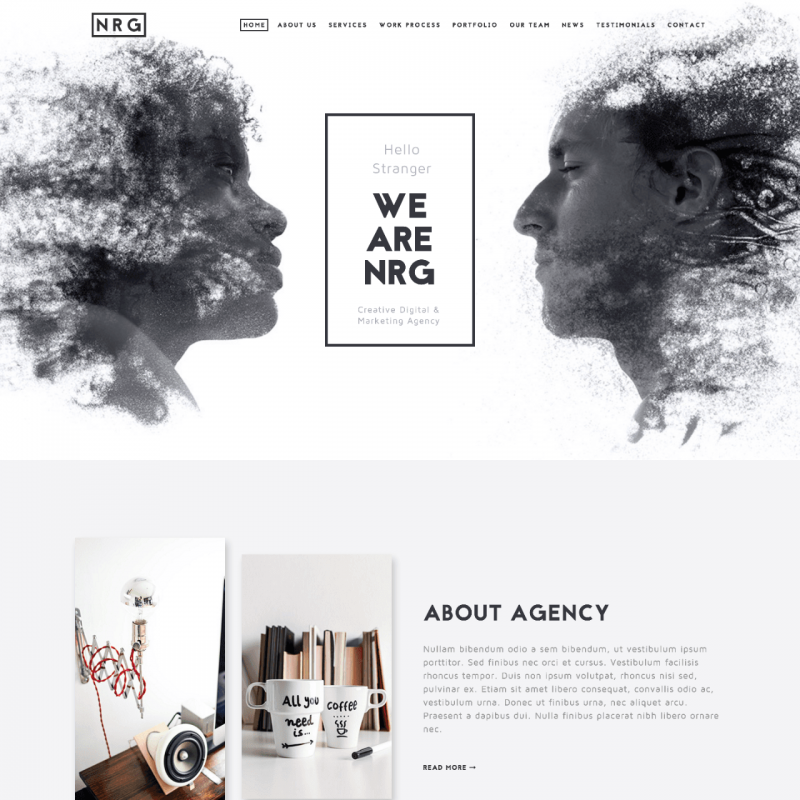 NRGagency uses a brand-color scheme setup. Picking every single colour is not necessary; this theme does not require you to waste your time for each of the numerous options. With this template, you have to pick your brand colour only once, and it will be used to apply to all colours on your site automatically. Additionally, you can pick 2 different Google fonts to define the typography for the whole site. 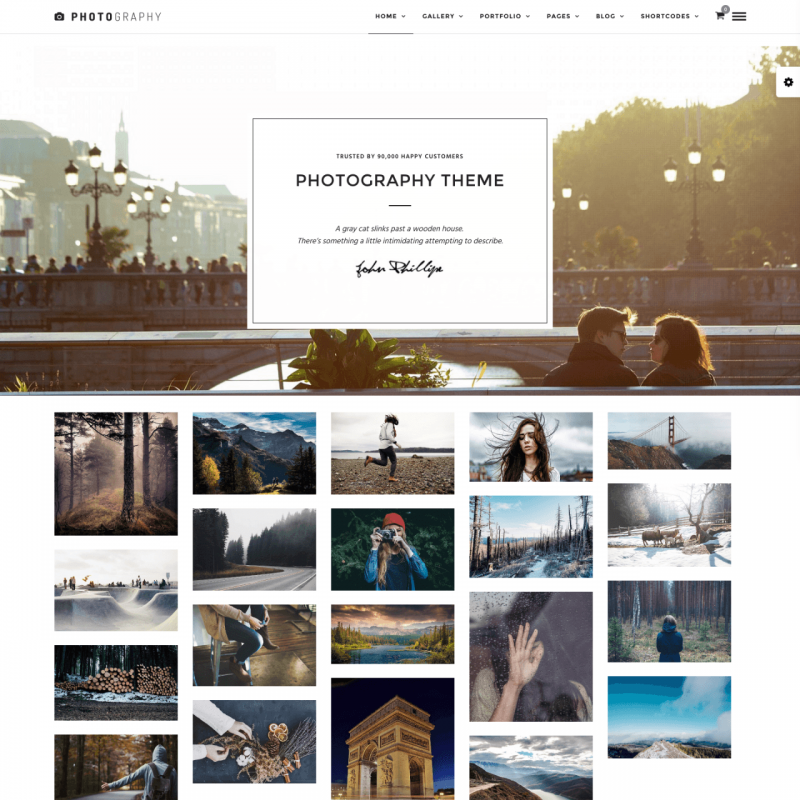 Outdoor WordPress theme is created for designers, photographers, artists. Use slider, carousel, fullscreen youtube video and image background features to showcase your work. 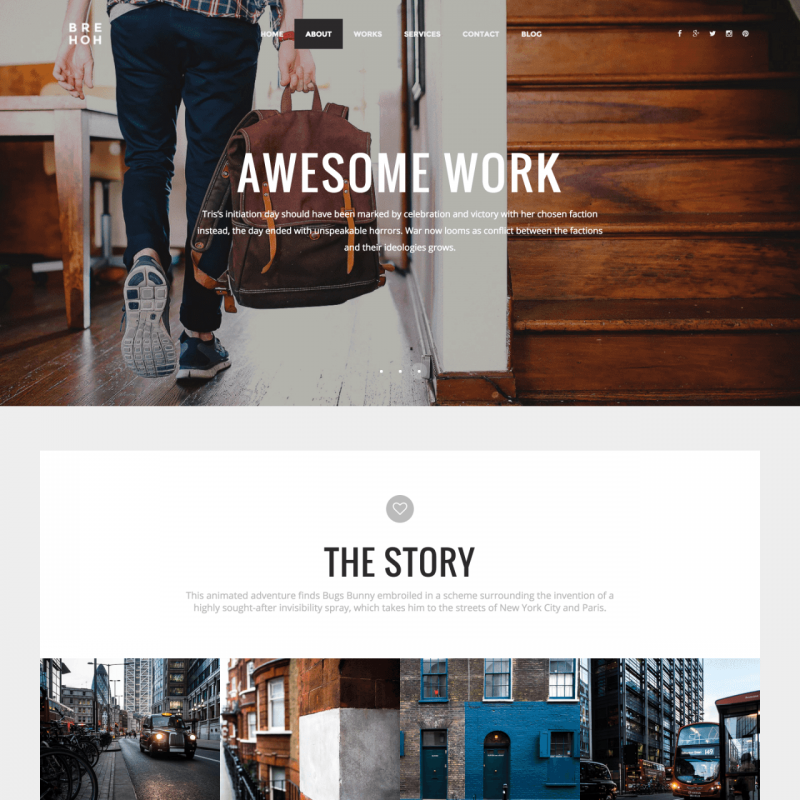 The theme comes with 6 different styles for homepages: Slider, Multi-Slideshow, Slideshow, Horizontal Carousel, Static image and Video and 5 different styles for portfolio archive pages. Even more! Select between 9 well-designed styles for portfolio single projects with the help of premium Visual Composer plugin included in the theme. Change website colors and typography with theme settings, fine-tune your posts and pages. 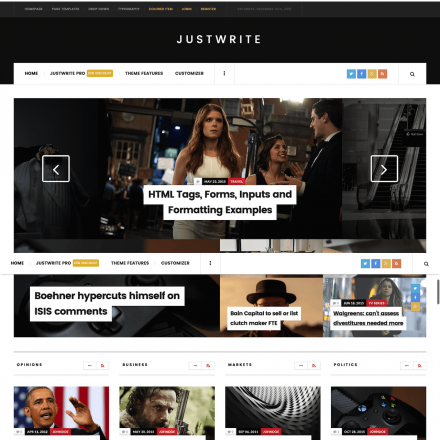 Use right, left sidebar or full width layout for your blog. Blog posts are featured with author box and navigation between posts. 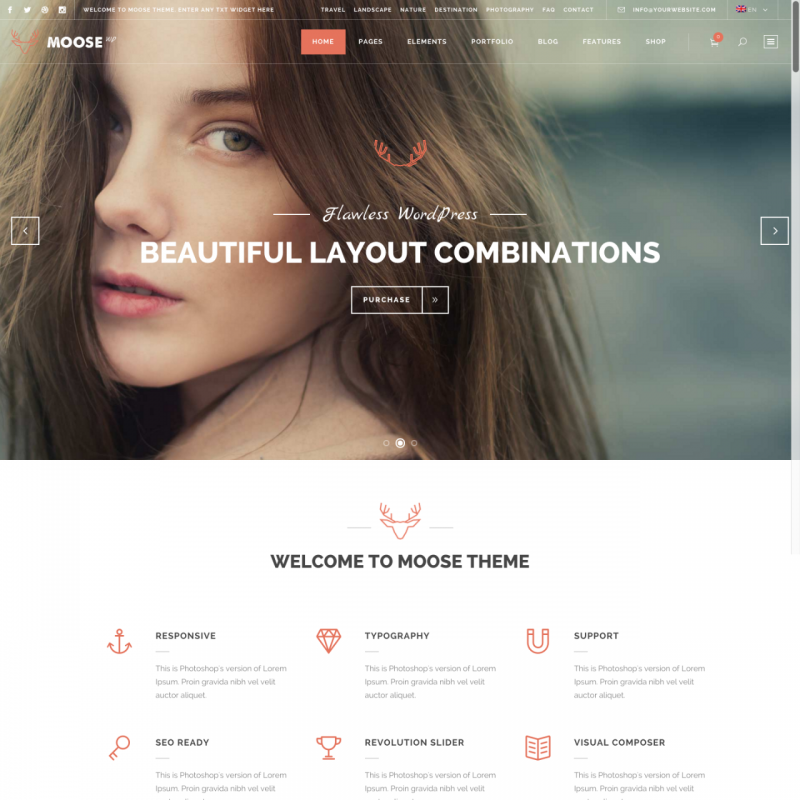 The theme comes with Sticky menu, Lightbox, One Page Scroll and other modern features. A basic and simple solution is made for the photography professionals who would like to display big-sized galleries and portfolio items for their clients. For sure, you have seen many sites that can take too much time to load when you are trying to load a large portfolio on one page. Those times are gone. Now, you are capable of displaying your portfolio in columns, the lower parts of which are not loading and not annoying your visitor until he or she scrolls down to reach those particular items. The theme supports custom password protected galleries. You can provide an access to individual galleries of your choice and allow your client to decide which photos to approve or reject without anyone else being able to see them. The theme includes a very useful drag-n-drop page content builder. 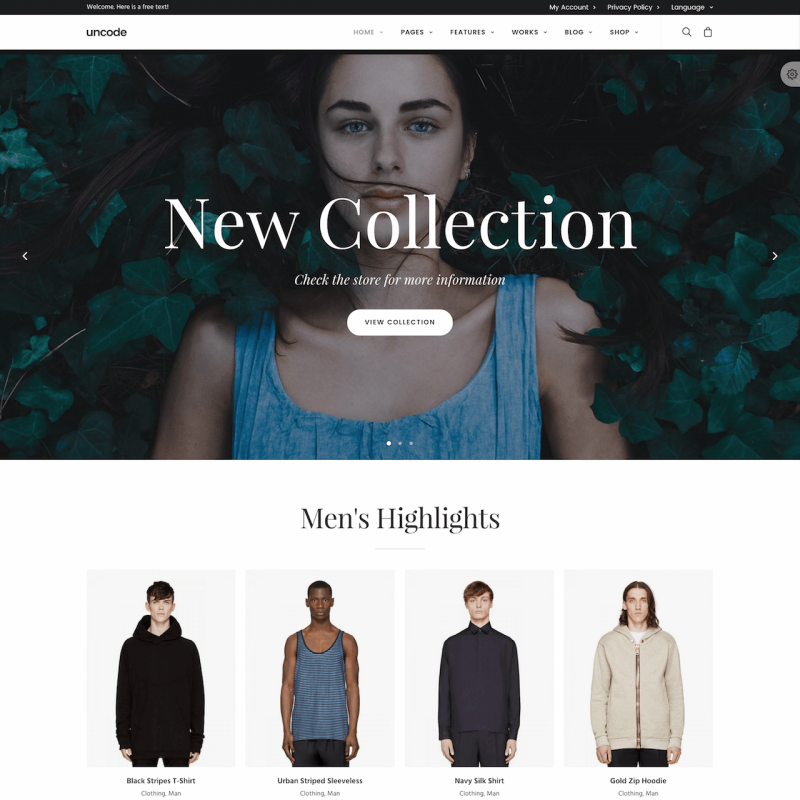 You can use Live Customizer to change the color of your site’s elements, the typography, the background and other things, and you will instantly see the results. 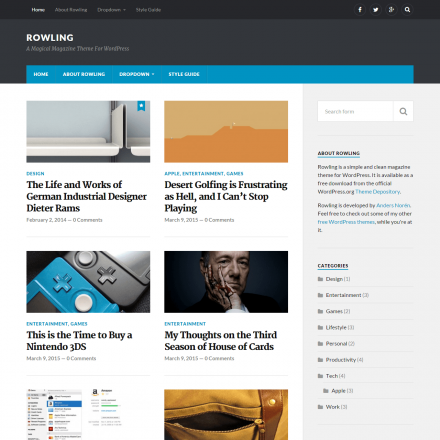 The theme has a responsive layout and passes Google’s test for mobile compatibility. 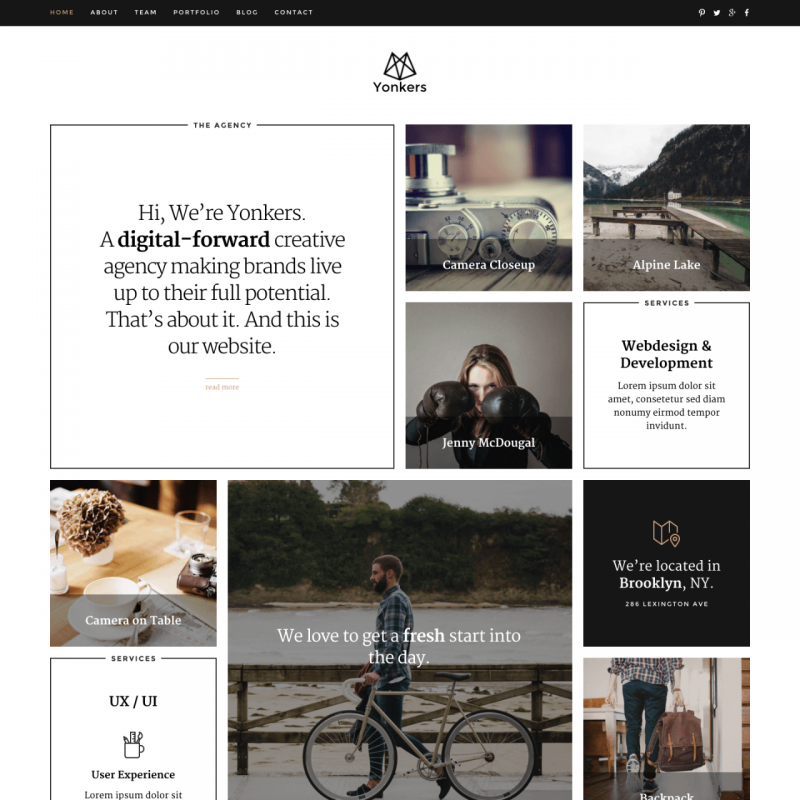 With its multicolumn responsive configuration and available Masonry or Isotope grids for content display, PineCone becomes the right choice for a portfolio website. A complete set of custom widgets allows you to connect your website to Flickr, Twitter, and Instagram. 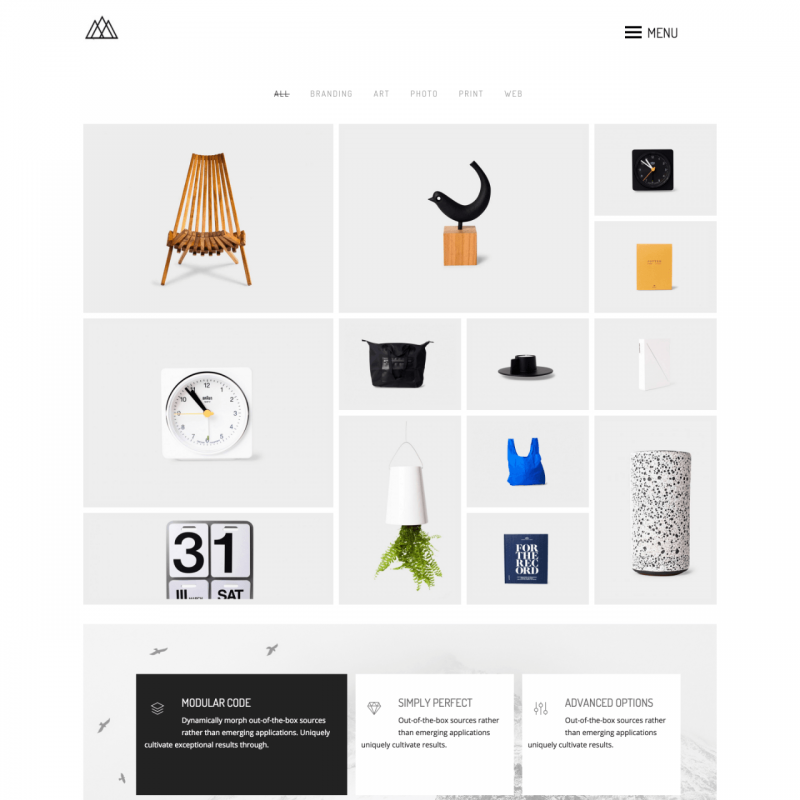 The PineCone theme is mobile phone and tablet-friendly. The cross-browser compatibility of Pinecone will expose your website for the maximum audience. With PineCone, you can create an incredible portfolio that will have virtually unlimited options. Smooth CSS3 animation gives your image grid an incredible look. 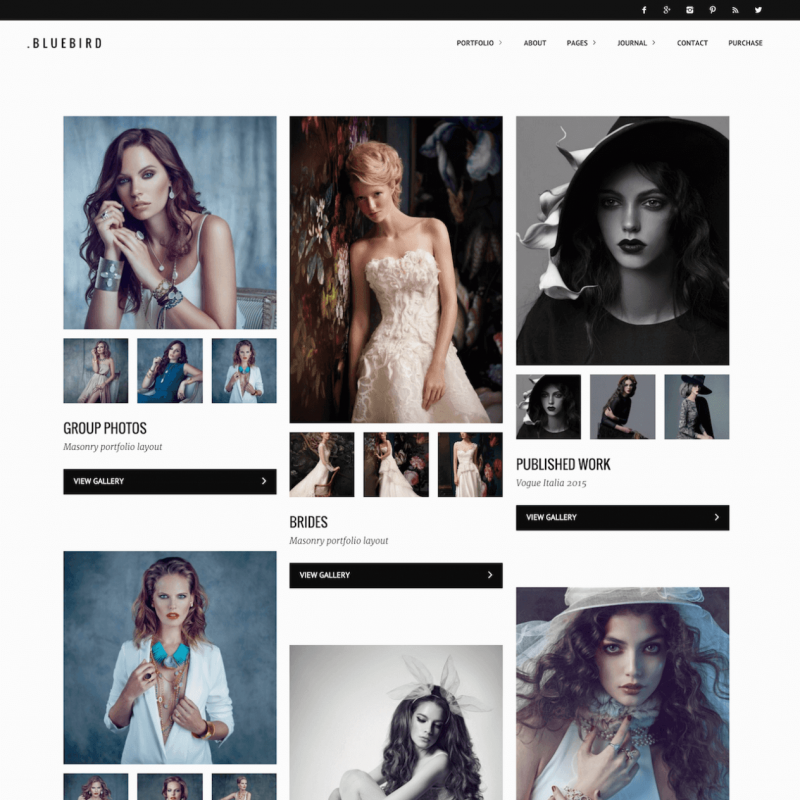 Choose a three or four column layout or use the full width portfolio layout with infinite image loading. 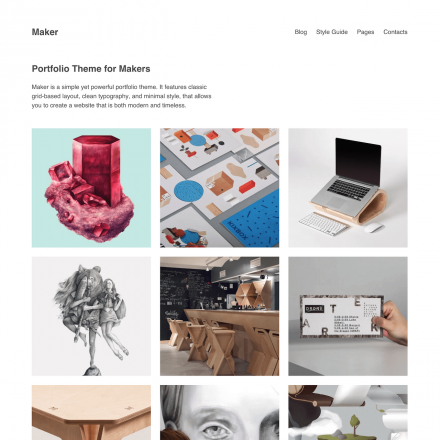 Create as many portfolio pages as you need. Sort your portfolio content with predefined categorized filters. Modify the fonts and colour style for every page. Create your own unique design by adding any titles and images. Any visual options of the PineCone theme will be very easy to set up on your site using the integrated Options Tree plugin. 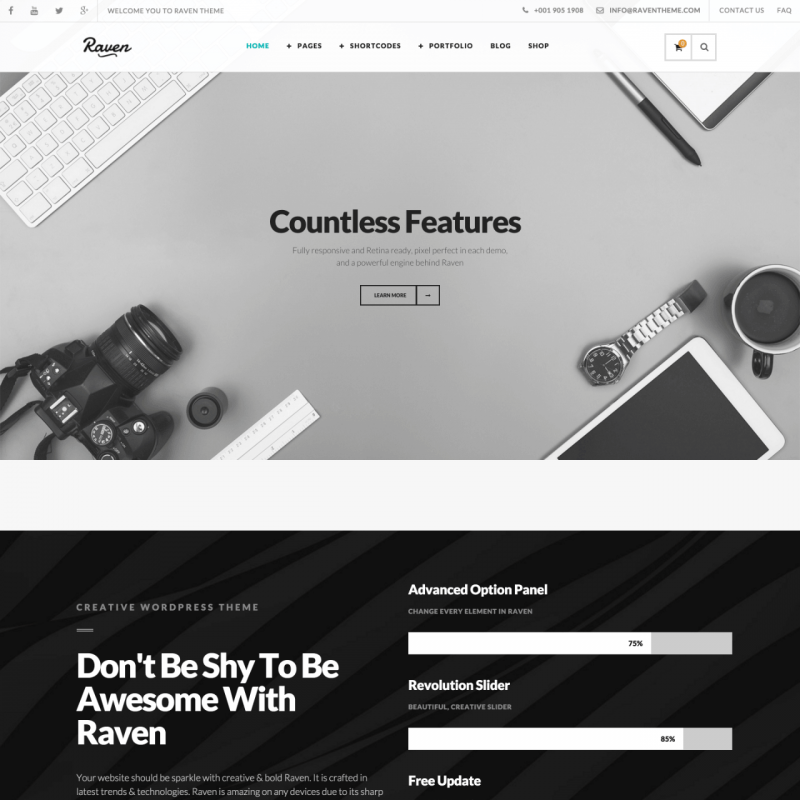 Raven represents a bold design and sharp look for everyone who decides to share their works on the web. For any type of business Raven provides a decent visual appearance. You can easily choose between pre-defined dark and light menu styles. The theme provides the set of powerful shortcodes. 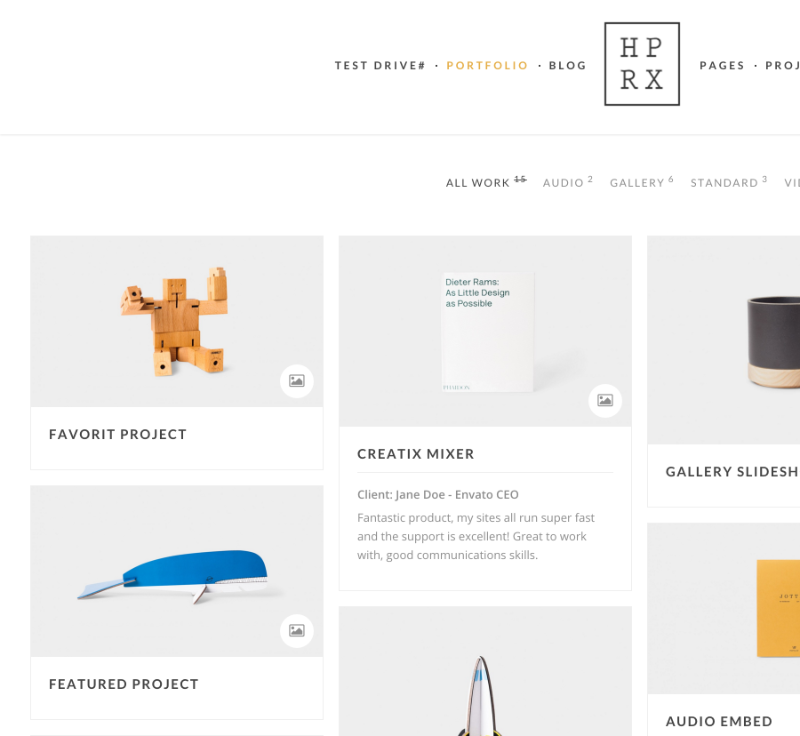 You can add Parallax sections and use versatile portfolio layouts. Share your own texts and ideas with Raven blog potential. 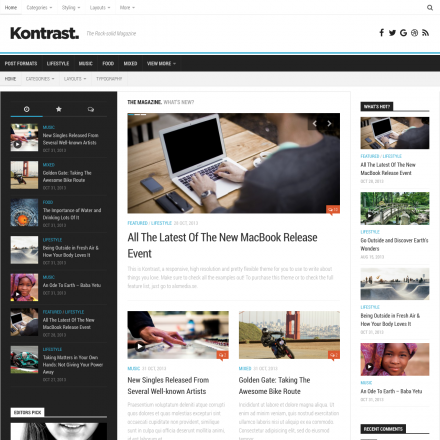 Five WordPress post formats are supported: standard, image, video, gallery and quote. Included premium plugins, like Visual Composer and Templatera gives you a discount for more than $70. Within its crisp design, Raven provides you the best way to focus the visitor attention on the creative content of you site. 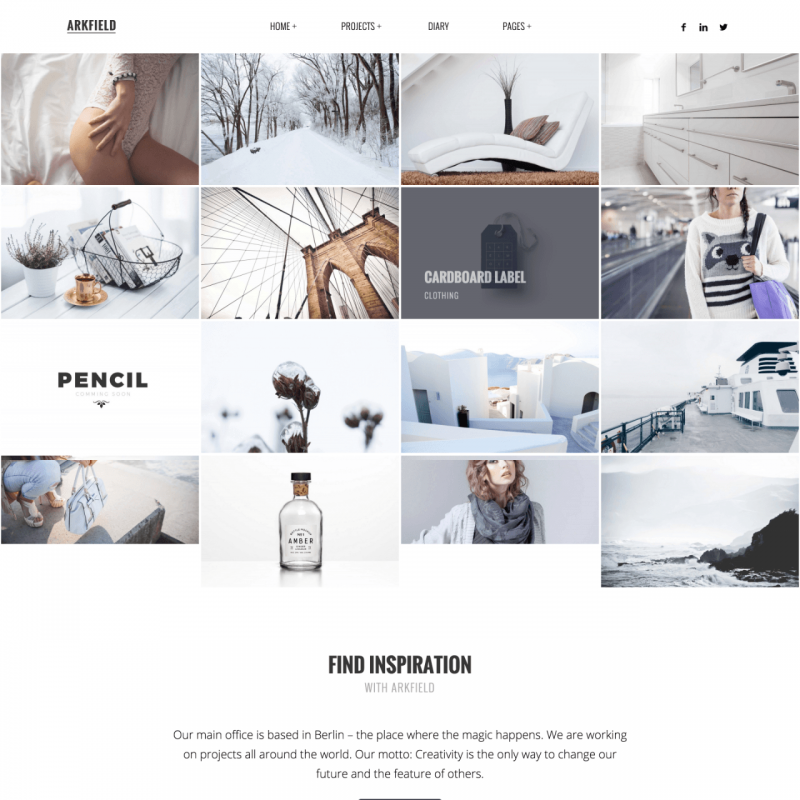 Thirteen is an attractive and minimal AJAX WordPress theme for photography professionals, web designers and all the creative people who love minimal and distraction-free design. You can create awesome albums and sliders with a matter of several clicks when using this theme’s predefined effects and features. 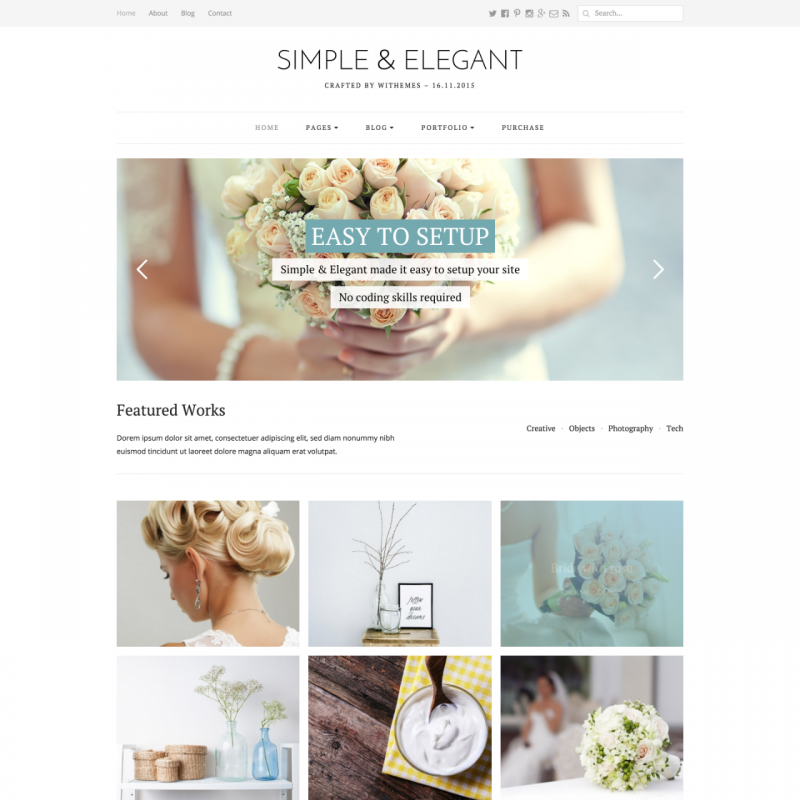 There theme is compatible with WPML and WooCommerce . The package also includes popular and super-powered Visual Composer. Visual Composer plugin with a comfortable Drag and Drop functionality will save you loads of time when you work on the content of your web site. If this neat design is not clean enough for you, there is a full-screen mode button available. 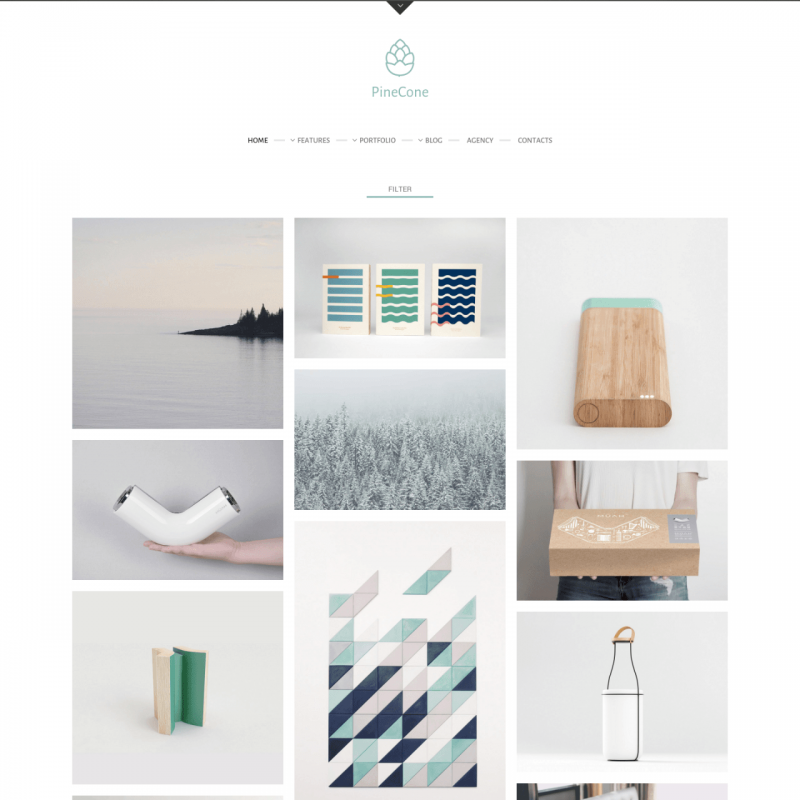 You are welcome to use the full-screen view in your portfolio, your blog, or your shop pages. The template is designed to be used with the Live Customizer to make sure what you see is what you get! You will have a single-mouse-click Demo Importer. Click the button and check out the way the Demo appears on your own web site. You will also be able to add more than 300 icons to your site from an exclusive icon library. Thirteen is highly responsive and Retina-compatible. Also works outstanding with WooCommerce. Your portfolio should not be waiting to be created by some extremely tough web designer. With the Throne WordPress theme, you can create your own digital presentation almost in no time, on your own. It was exclusively designed to represent illustration or creative sketches. 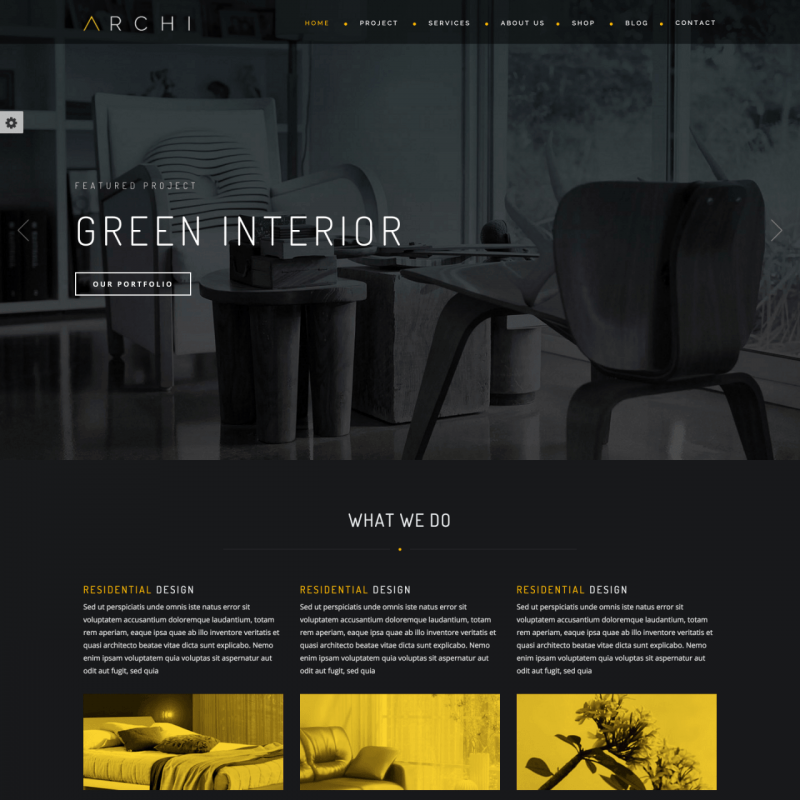 Works really well to post virtual projects of architect specialists or studios. Multi-page or One-page configuration is available. 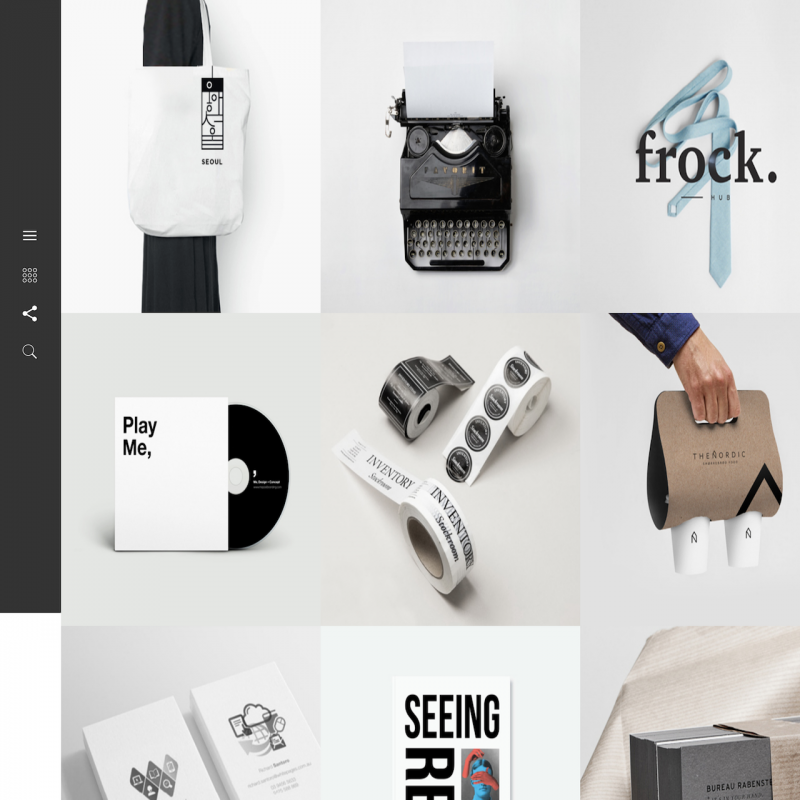 Throne presents a decent set of ready-to-go templates for the portfolio of your sweetest dreams. And if you wanted something even more than that, a broad range of theme options helps you to achieve a truly unique look of your portfolio. Choose your custom homepage configuration with different types of slider. Choose the best way for your site’s users to navigate it with a variety of dropdown menus with different placement. All the configurations presented are screen-adoptable and suit well for any devices and display resolutions. Add an individual compartment for different projects. Every single page can have its own showcase specific design. 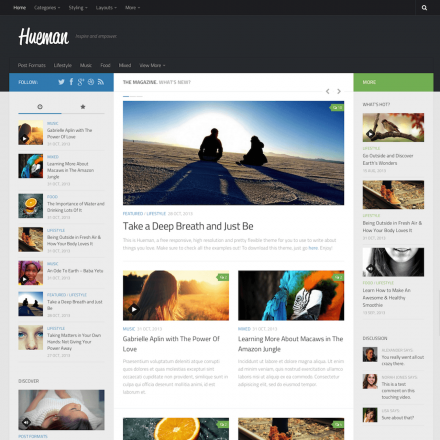 Choose the best view for your blog with Masonry or Timeline layout. Advanced feedback capabilities can be present on your pages, using full support for Contact Forms 7. 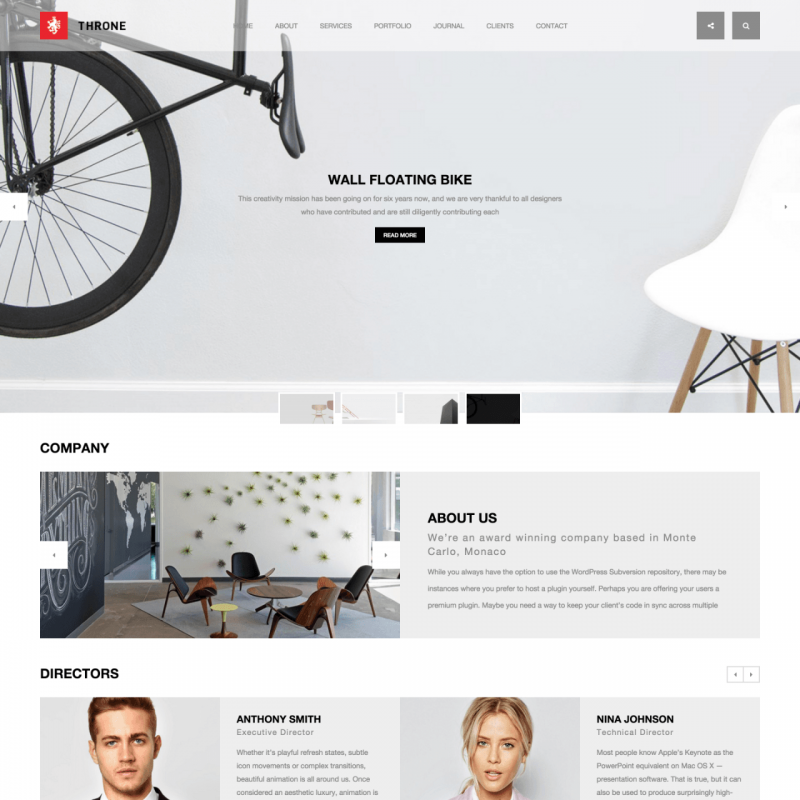 Yonkers is a Retina-ready and responsive WordPress theme featuring a grid system layout. It is created with the new Packery extension. It means that items are intelligently ordered on the page and fill in all the empty places on their own. Retina-ready icons from the demo and about 70 original icons come with this theme for free. Visual Composer, the most powerful of the page builder plugins, is also included in the theme. It’s a Drag&Drop tool which is going to save you incredible amount of the time you spend on the content of your site. It will save you 33 U.S. dollars. Yonkers includes a very advanced administration panel which lets you customize your theme really easily and quickly. The theme uses the REDUX option framework, an extensible and simple framework for WP plugins and themes. Demo XML data for a quick set up is also available. 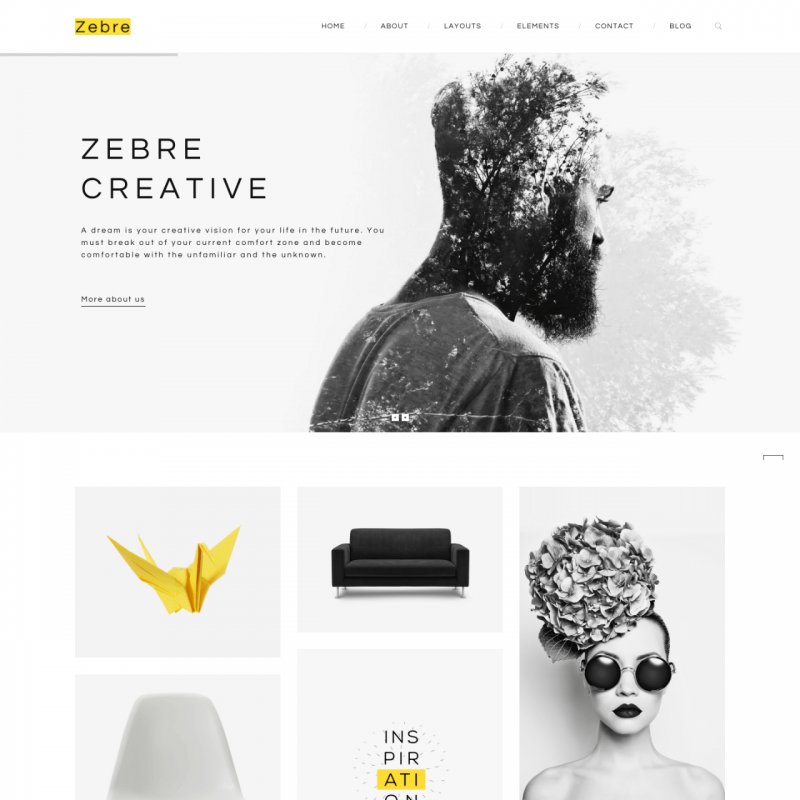 Zebre theme was created for freelance photographers, designers, developers and creative studios that are going to let the world see their portfolio with minimal and a bit prevailing background. Zebre is a very lucky combination of these qualities. The theme includes great functional power and configuration options within its simplicity. 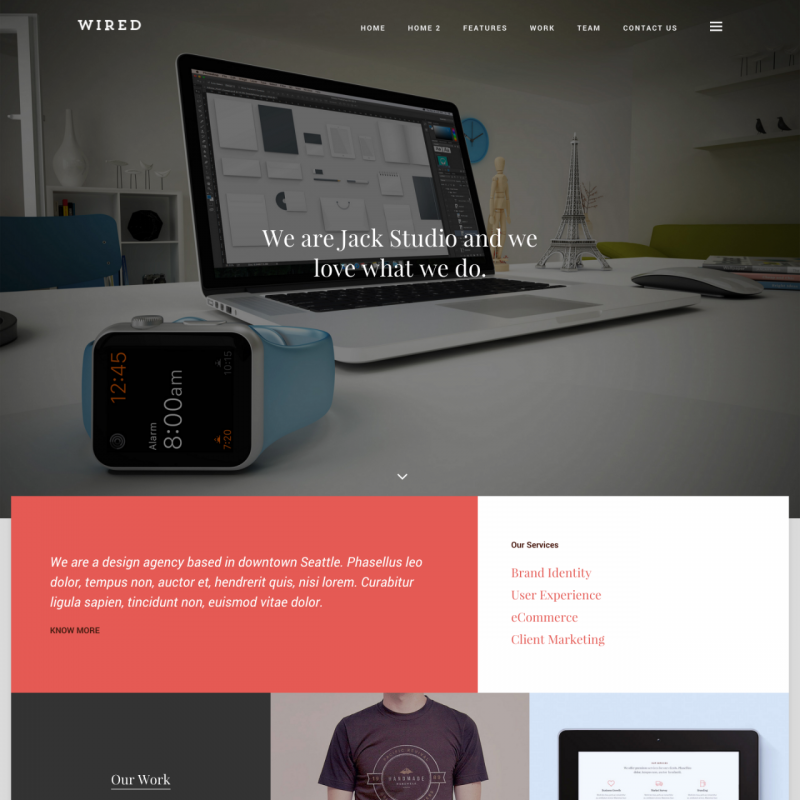 This theme is Retina-ready and perfectly shows up at any mobile or desktop devices. Every design element will get a crisp look at any display resolution. 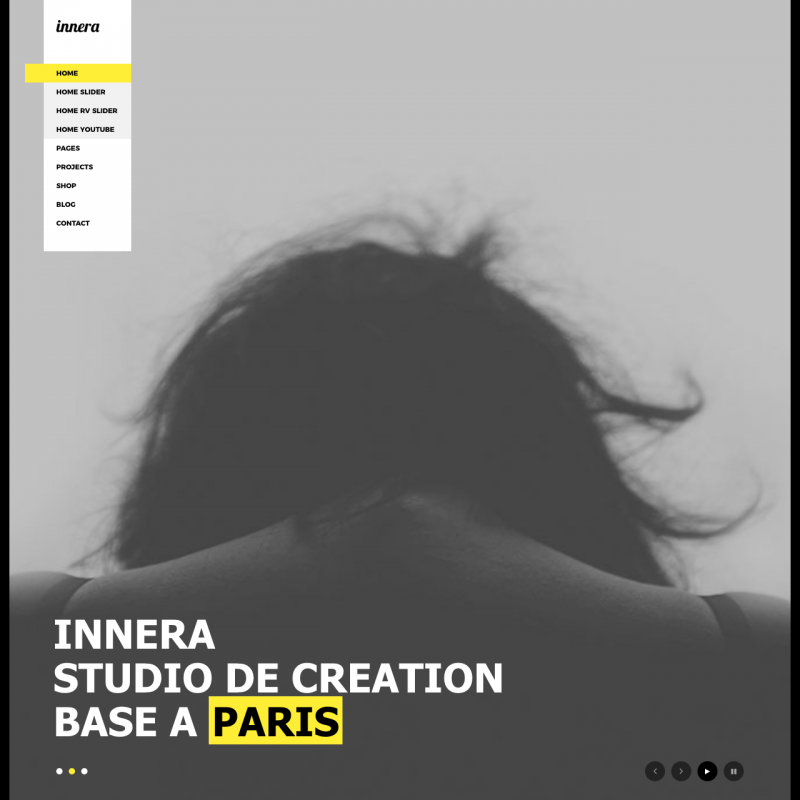 It will just take a few minutes to install the Zebre WordPress theme and start using it. Customising all the visual characteristics can be completed in a drag&drop mode which allows you to fill the page space very quickly. And the Slider Revolution commercial plugin that comes with Zebre absolutely for free allows to create on your site unique atmosphere. Zebre gives every one of its users a number of powerful opportunities to express themselves with modern and convenient tools.